Still reeling from the excellent guacamole we’d had at Henry’s the night before, we kept breakfast simple with a quick trip through the McDonald’s line. It’s never my first choice, but it’s quick. 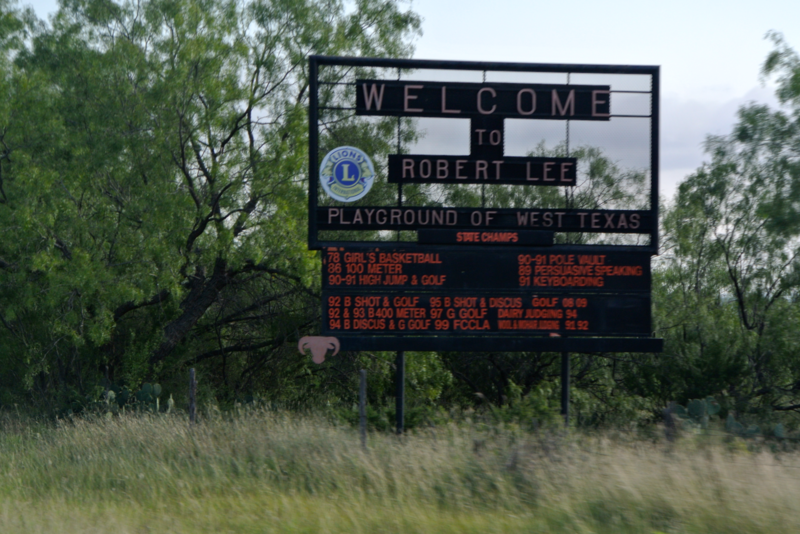 From San Angelo, our route took us north on Highway 208 for Robert Lee. As we headed up Andrews Street (208), preparing to leave the city, a bakery caught our eye. 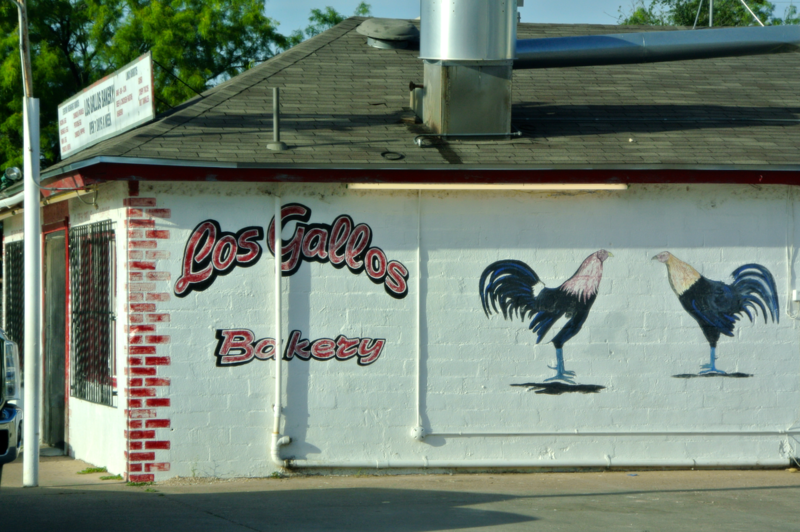 As if it wasn’t already obvious, “Los Gallos” means “the chickens” in Spanish. I sampled their cinnamon roll, and it was pretty darn good. Enjoying our pastries, we set the course through the rugged landscape of northern Tom Green and southern Coke Counties, passing through some beautiful scenery. 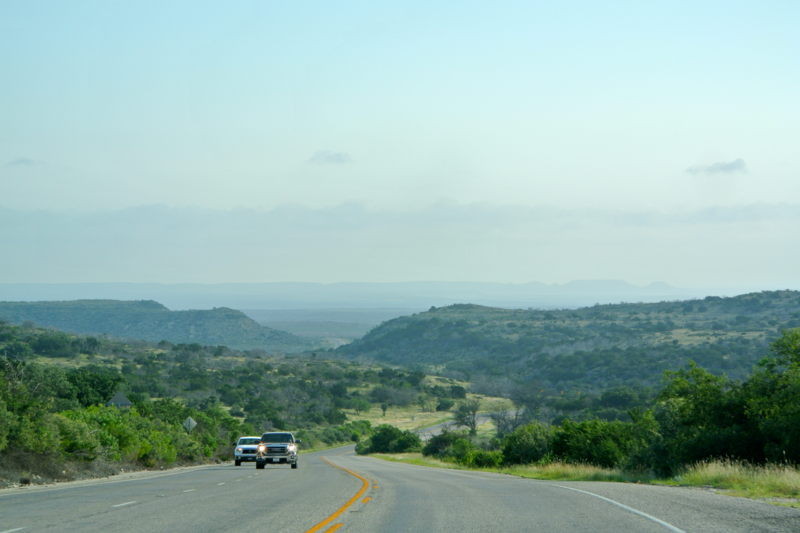 This hilly pass looks right at home among the Hill Country, or perhaps somewhere in the Brackettville-Rocksprings area of southwestern Texas. I’ve never heard of anyone acclaiming this part of the state, but views like this one are very pretty to me. 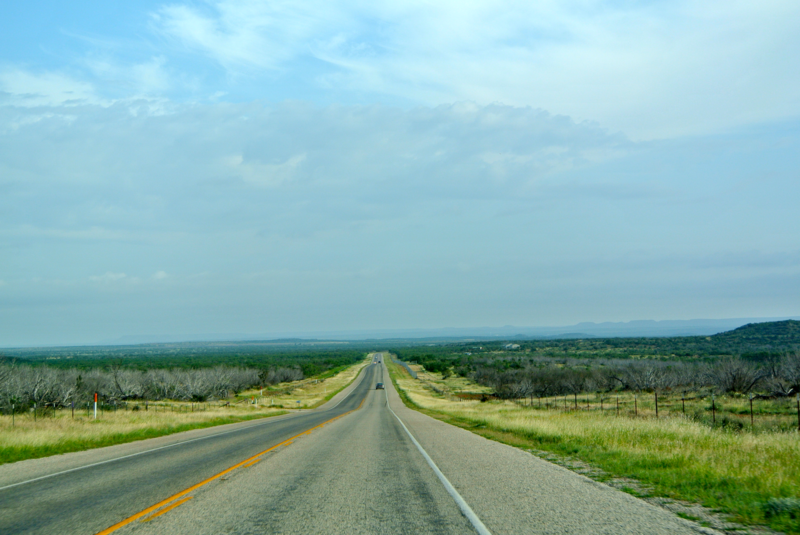 Now other portions of the road were lined with forests of dead mesquite trees. 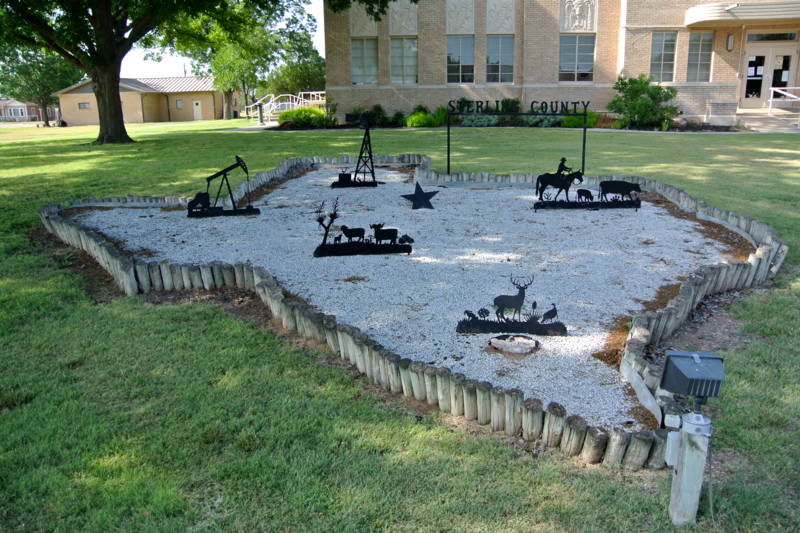 Those, of course, weren’t as picturesque, but “the Playground of West Texas” is still a nice place to visit. 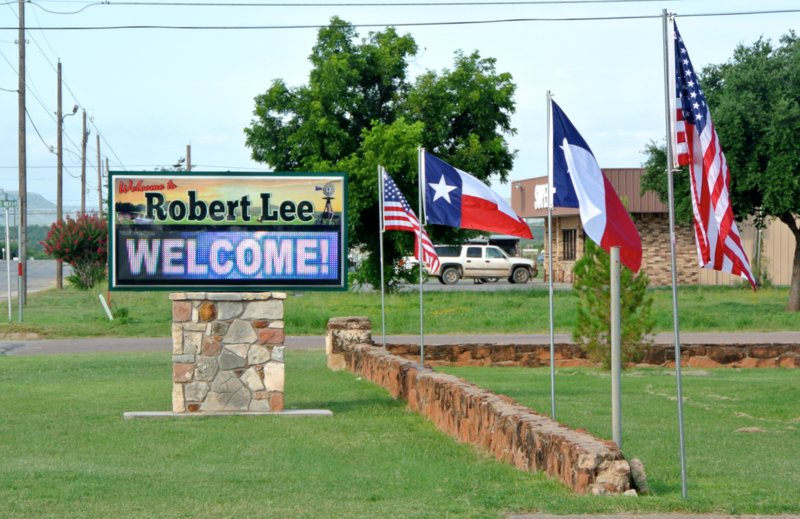 We’d passed through nearly the entire town of Robert Lee before we found the courthouse. As the city began to fade away, we realized we’d gone too far and turned around to find the downtown district. There seemed to be a few businesses left, but shopper traffic appeared pretty “still” when I visited. Whether that was because it was Sunday, or whether the town is truly “dried up”, I don’t know. 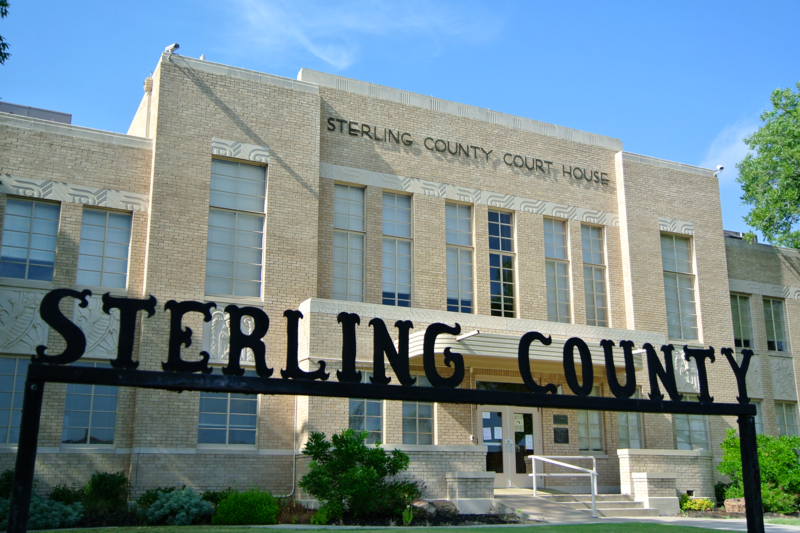 The courthouse is from the 1950s, and that’s feasible as soon as one enters the square. 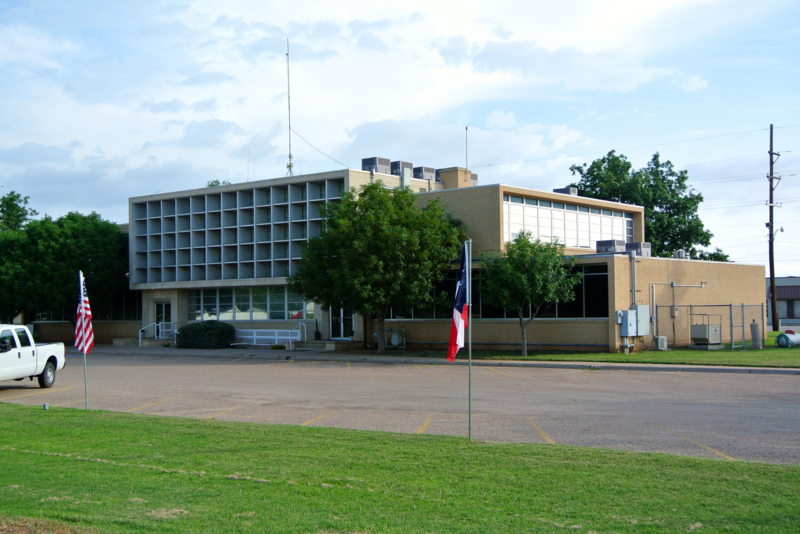 The solar screens are a key characteristic of this one, a feature very similar to the previous Zavala County courthouse that dates from the same era. The design came from Wyatt C. Hedrick, a popular modern architect from that time. There’s not much to see in terms of the courthouse itself, but the grounds are nice. 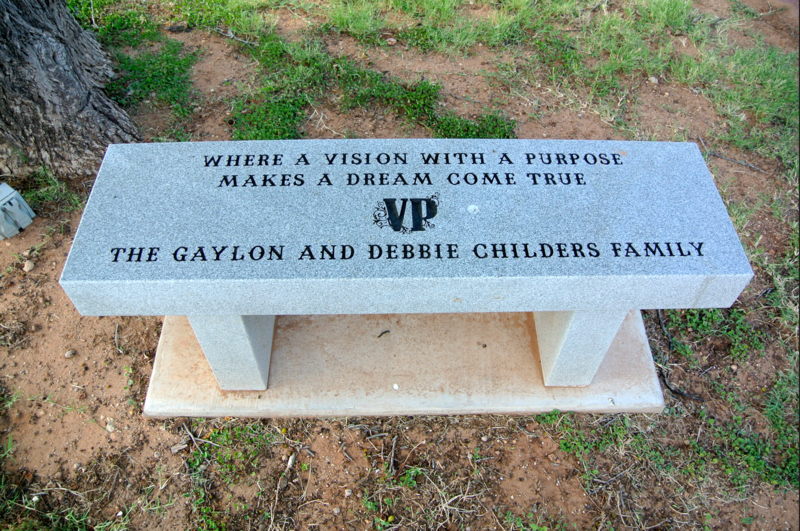 A historic cornerstone and a public memorial garden aid the appeal. I also took a liking to an LED welcome sign, a few hundred feet from the lawn. 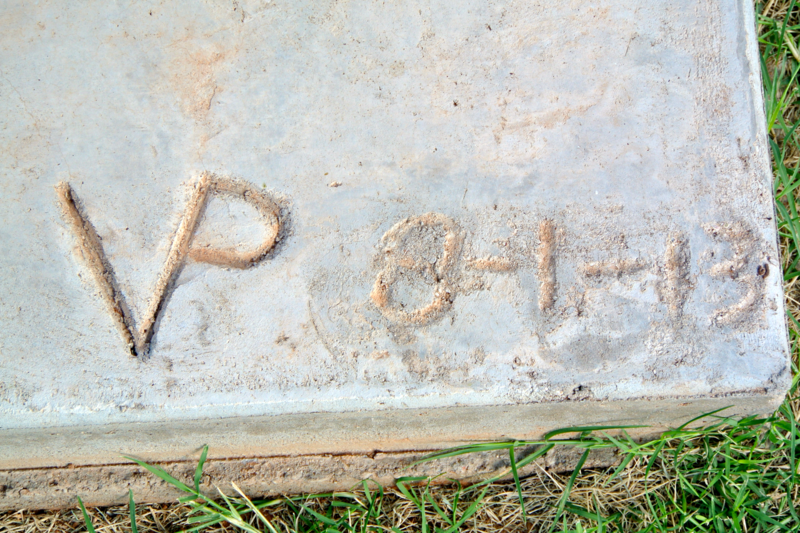 The concrete base says that it was installed on August 1, 2013. The “VP” was confusing to me. As I moved around the memorial garden, I tried to rack my brain for what it could possibly stand for. “RL” would be the initials for the town, “C” for the county, etc. 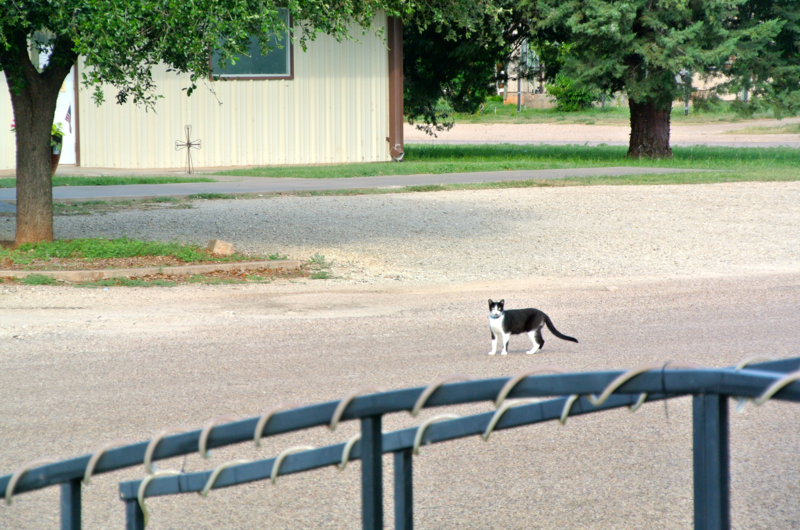 I discovered a black and white cat crouched near a small handicap-accessible bridge to the park. He/she wasn’t too keen on sticking around to let me get close. VP! What does that mean? 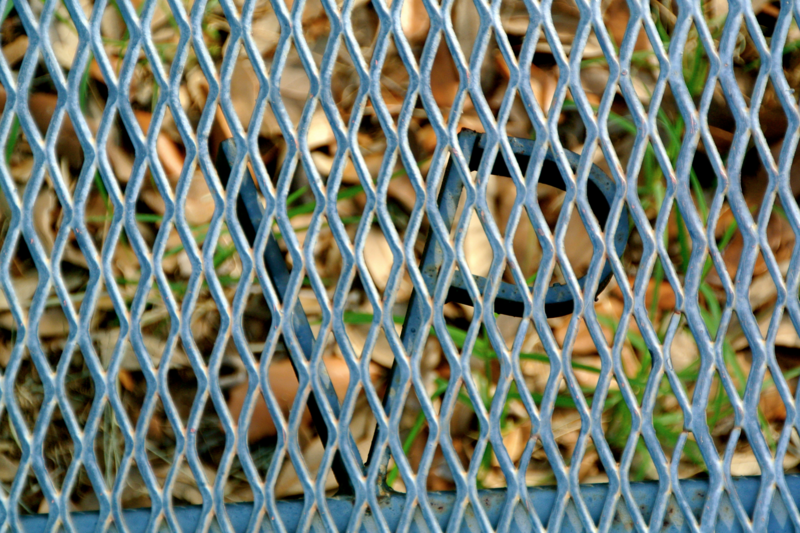 Only after spying the letters for a third time (on a bench in the garden), did I go back and photograph it in the other two locations. Even after finishing with my pictures, I couldn’t figure out its significance. 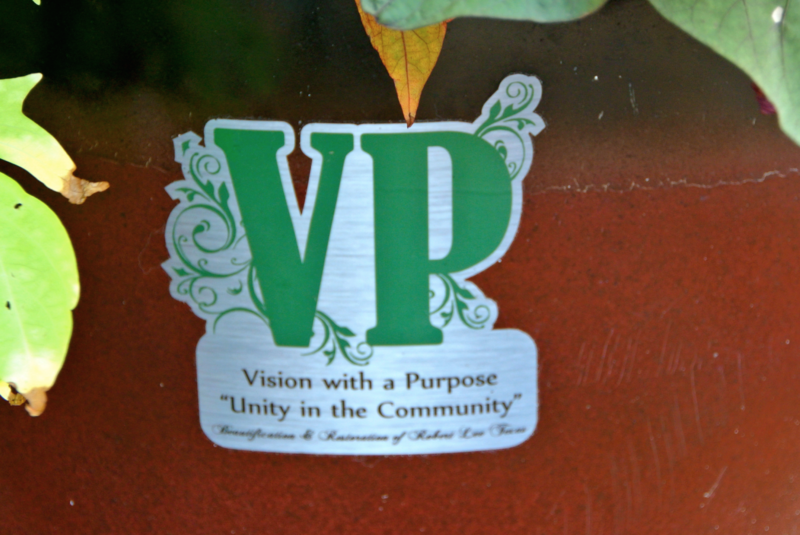 “Vision with a Purpose“: the mantra of Robert Lee citizens in assisting their city with its beautification and restoration. It’s nice to see the people of a town come together this way and take pride in their community. Too many times have I seen otherwise. 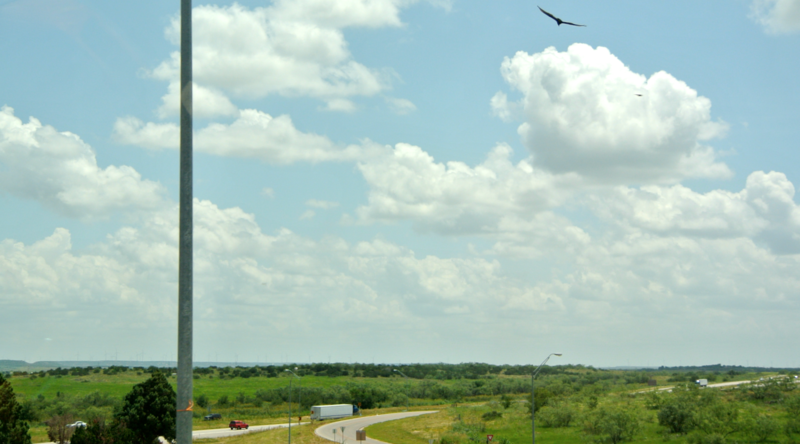 We were headed west again now, moving closer and closer back to the Midland/Odessa Petroplex. 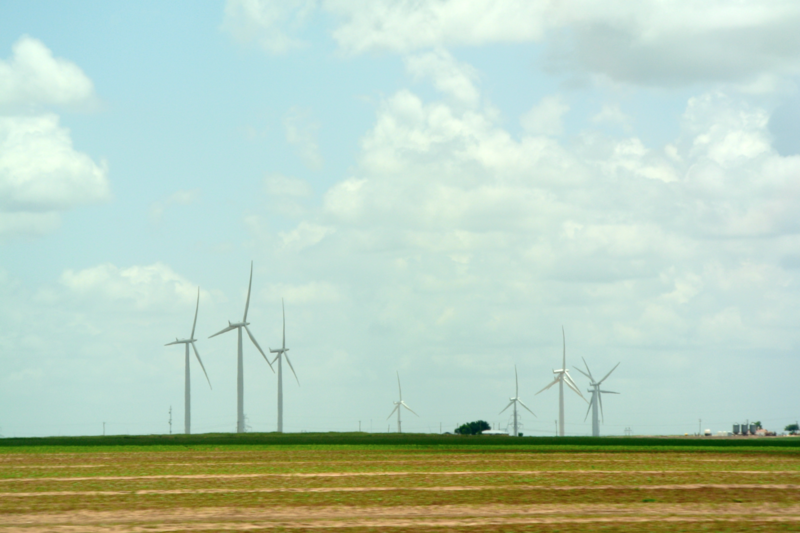 But between this area and the outskirts of the Permian Basin lies Wind Country, the hotspot of all wind energy in Texas. 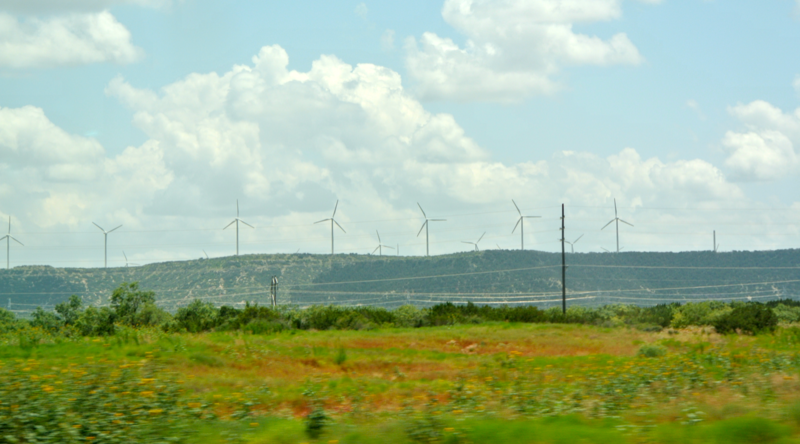 Stretching south to the tip of Upton County (McCamey), and coming north all the way to the Snyder area, this area is populated with wind turbines on nearly every horizon. 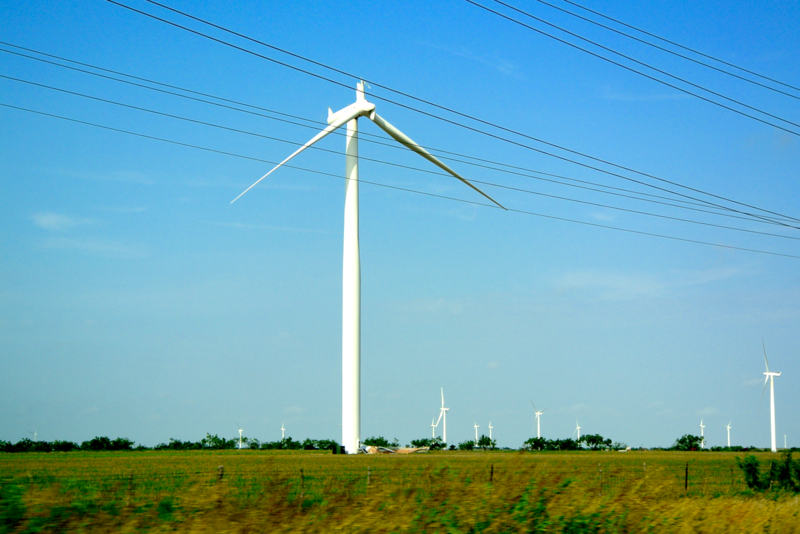 Between Coke and Sterling Counties, we encountered a variety of turbines, some with different shaped control boxes, some in working condition, some with physical damage. Here and there stood one whose blades weren’t turning, and in one case, we even saw a crane working to repair one. 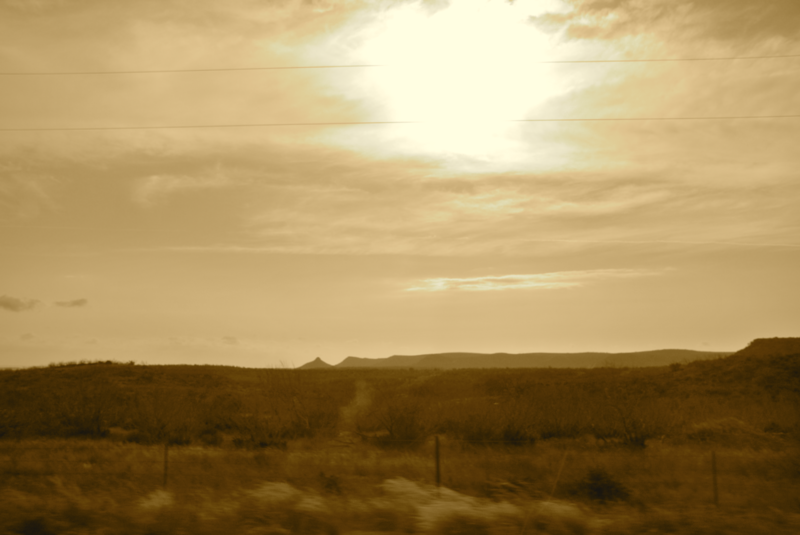 Landscapes like these remained constant all the way to Sterling City. Plucked straight from the Great Depression era, this 1938 model is most definitely the work of David S. Castle. 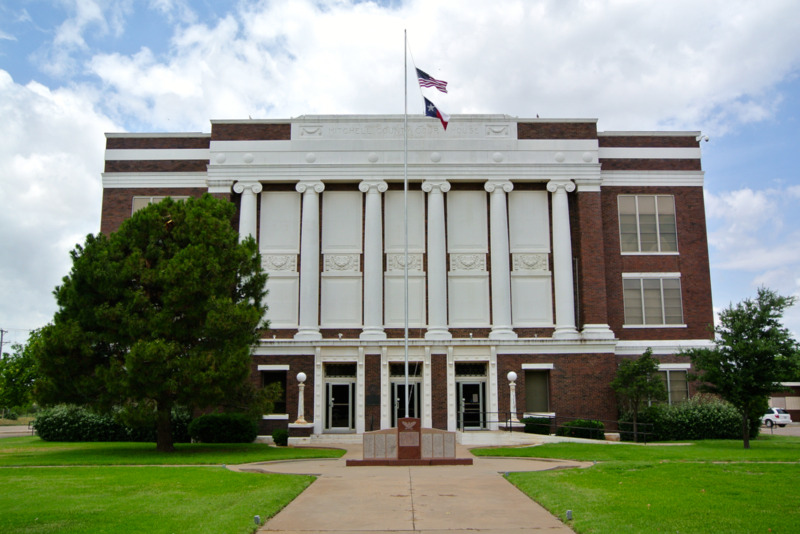 Unlike his creations in Winkler and Reagan Counties, this one has a great deal of Art-Deco ornamental elements, typical of the time. 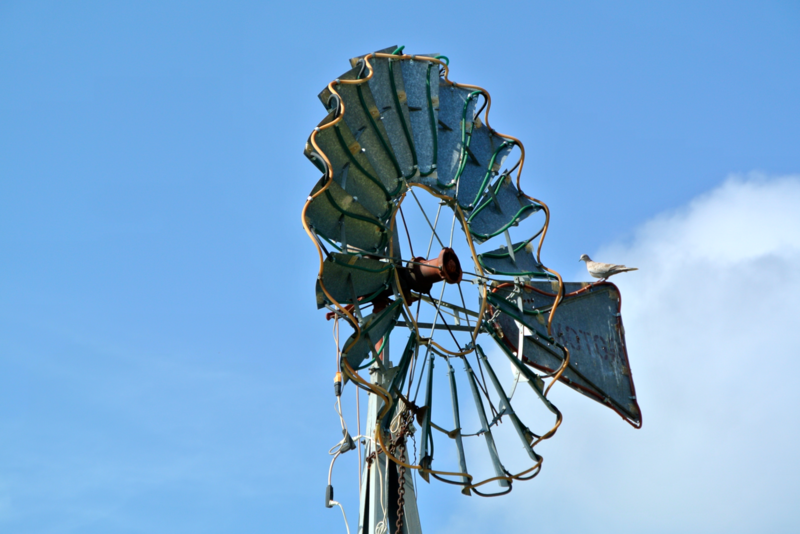 There’s a lot to see on the lawn here, including a historic jail, a welcome sign built around an old wheel, a windmill, and a large Texas-shaped rock garden. It’s a fine courthouse, but wouldn’t win any special awards in my book. So we moved on, trekking one more county to the west. Looks like someone’s been using this for target practice. 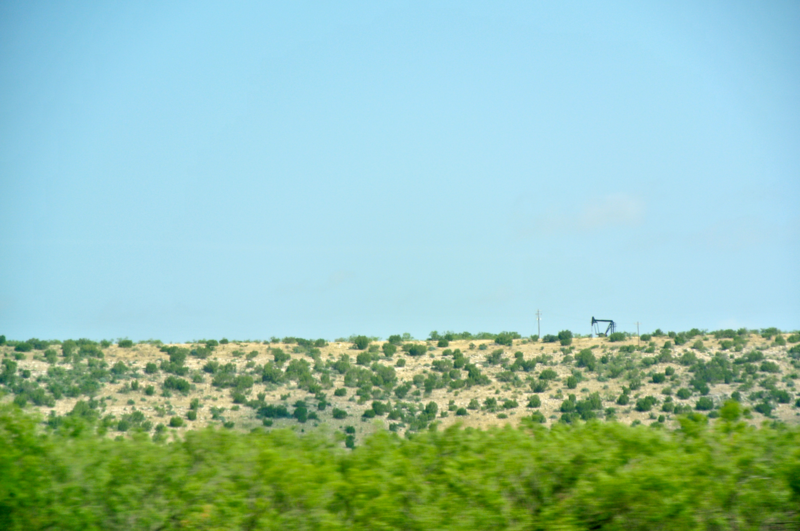 The switch back into the pump jack scene indicated we were getting close to the Permian Basin yet again, one of the most desolate parts of the state. 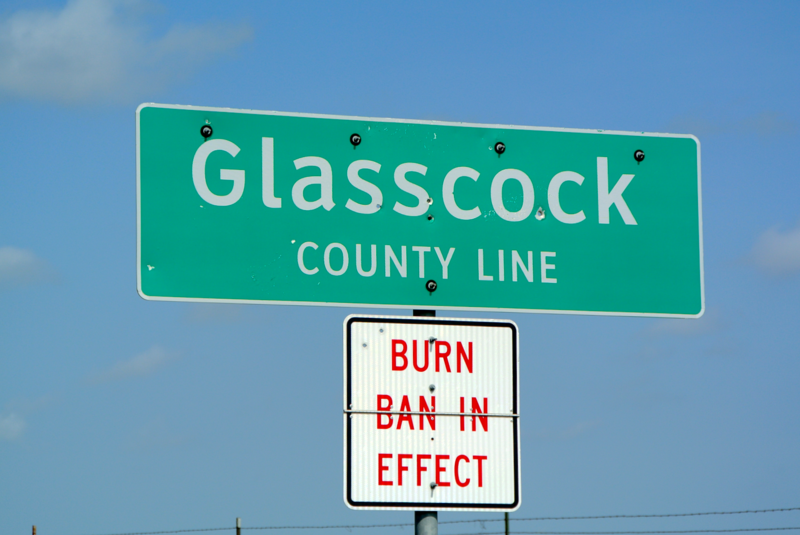 That’s why the name of Glasscock County’s seat is so confusing. It’s called Garden City, and though you’d expect to find fertile plains of sunflowers, all you’ll see is mesquite for miles. While here I learned that the town used to be named Gardener City. When that became too hard to say, they shortened it to Garden City, though there’s nothing close to a lush landscape of wildflowers to be found anywhere nearby. A man in a red shirt was the first person I glimpsed while taking my pictures. He was busy walking to and fro, from the courthouse to a wooden shed on the lawn’s corner, carrying books and other items. My first thought was: the courthouse is open? It was Sunday, after all. They talked the entire time I was photographing the building, and about the time I finished, they called me over. 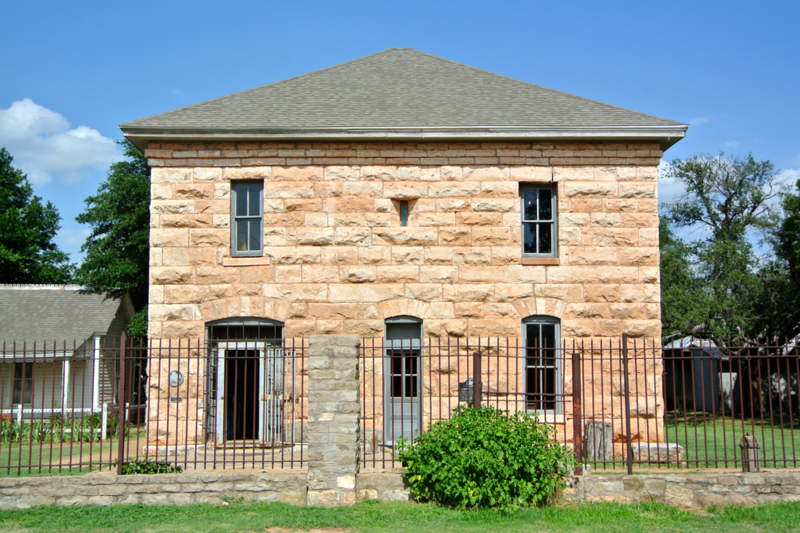 Alan Dierschke is Glasscock County’s treasurer, and an expert on all things relating to the history of this courthouse. 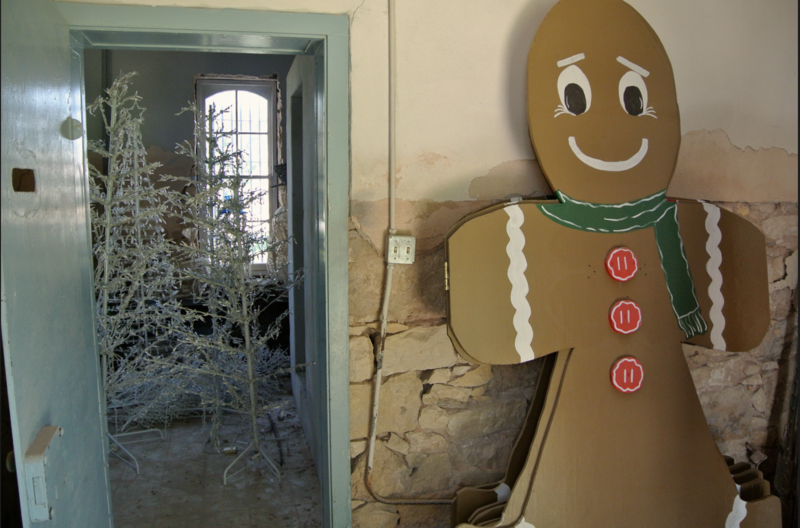 He was kind enough to invite us in for a tour of the building, built in 1910. 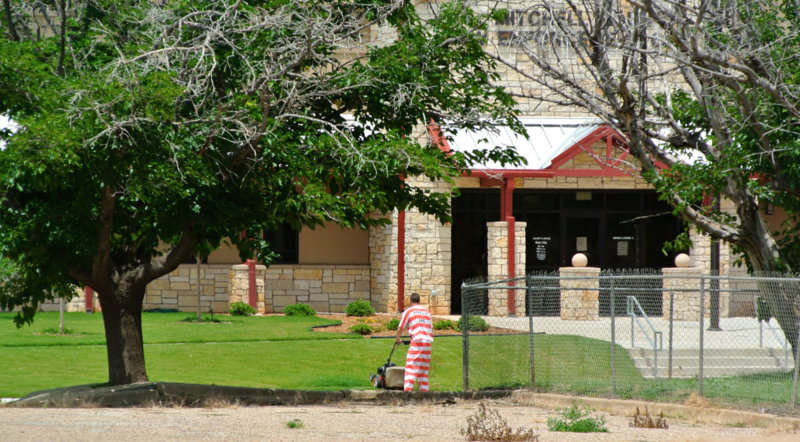 But before we stepped through the courthouse doors, he took us to the historic county jail, on one of the lawn’s corners. 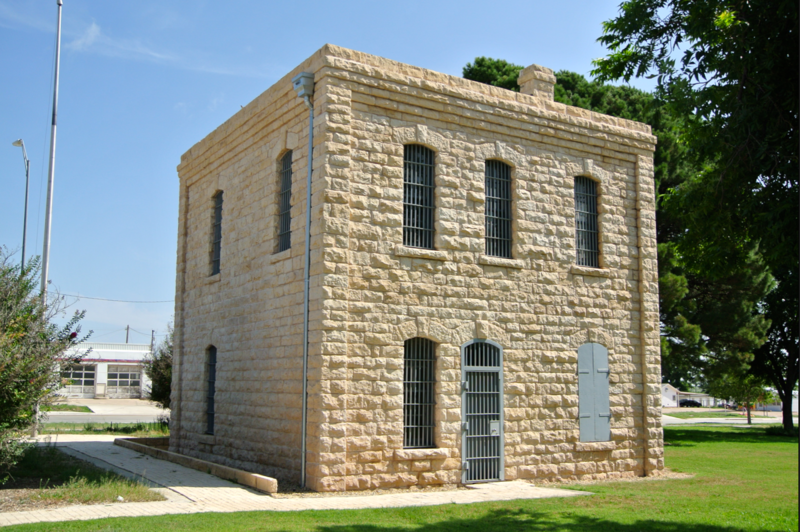 According to Mr. Dierschke, this jail was the county’s first courthouse, constructed in 1894. Sixteen years later, its role switched when the county built the much larger, much more impressive building. 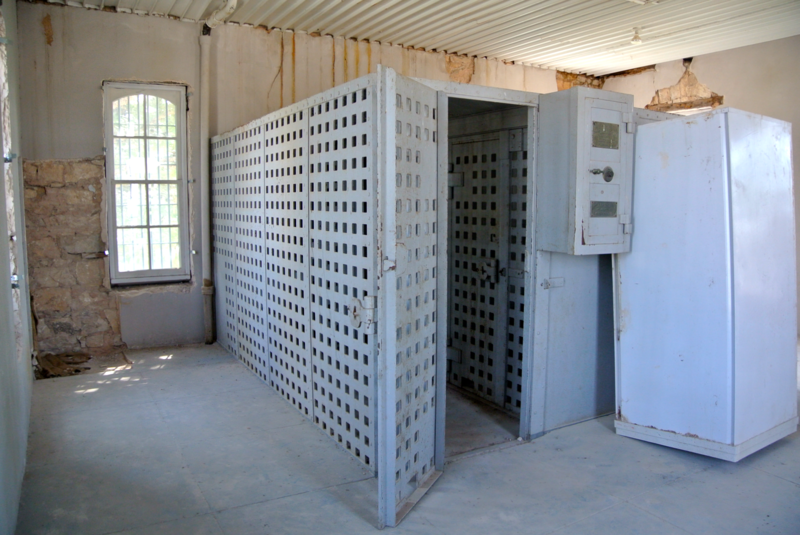 Today it still has historic jail cells, but they use it for storage, not incarceration. 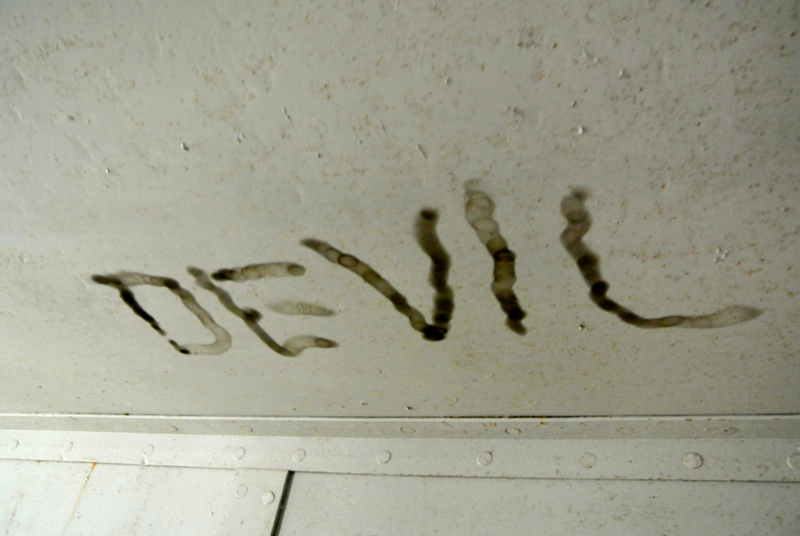 As some disturbing graffiti would attest, this facility was still in use as late as the 1970s. 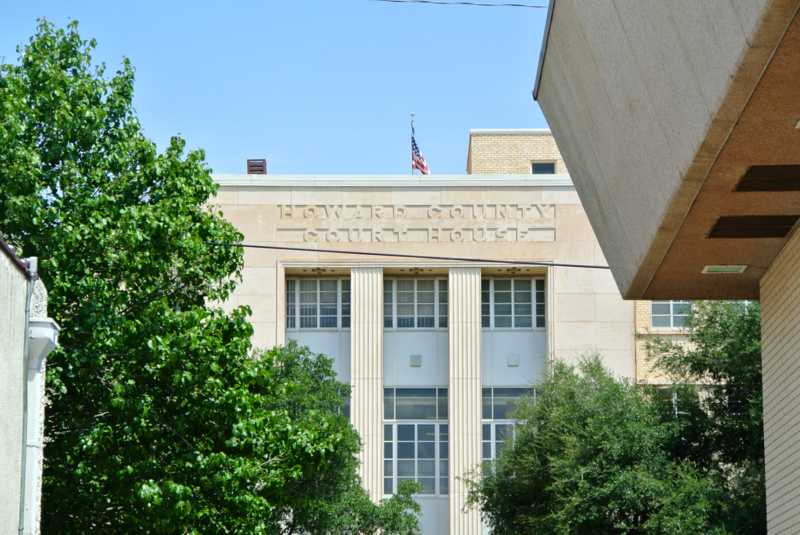 Next came the current courthouse, which was remodeled in typical 1970s fashion. 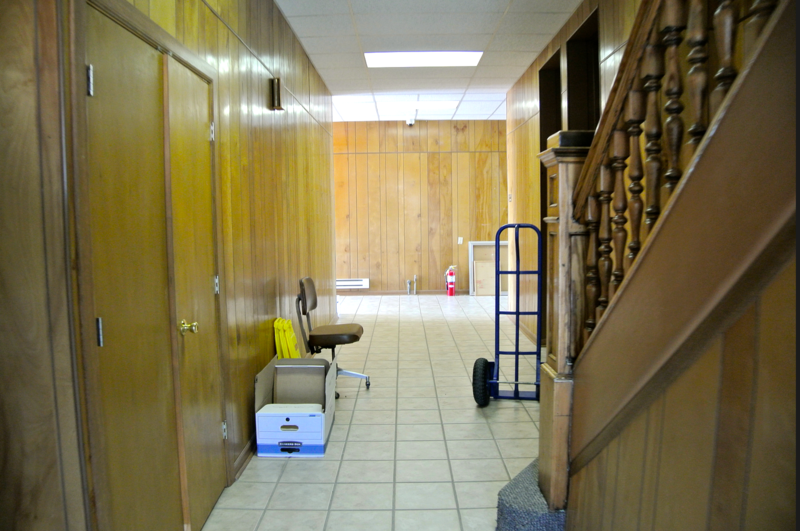 Dropped ceilings, wooden paneling along the walls, carpet flooring…the list goes on. 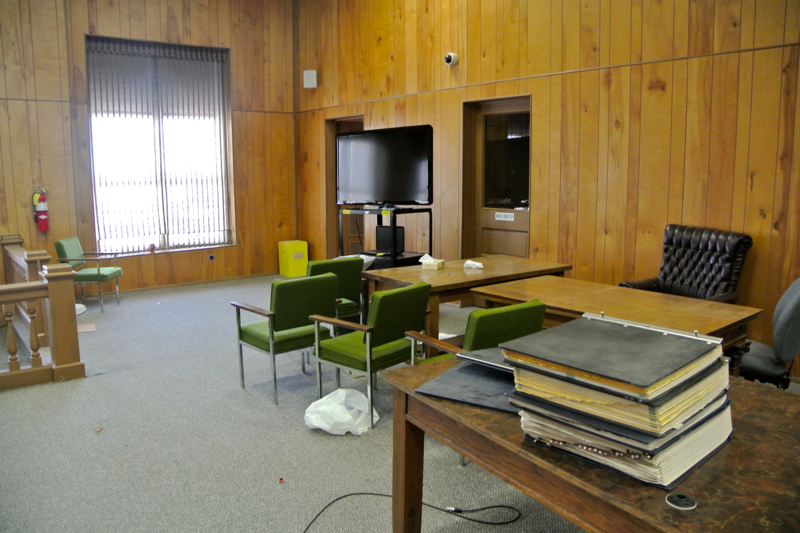 The courtroom was haphazardly strewn about with chairs, boxes, books, and papers. 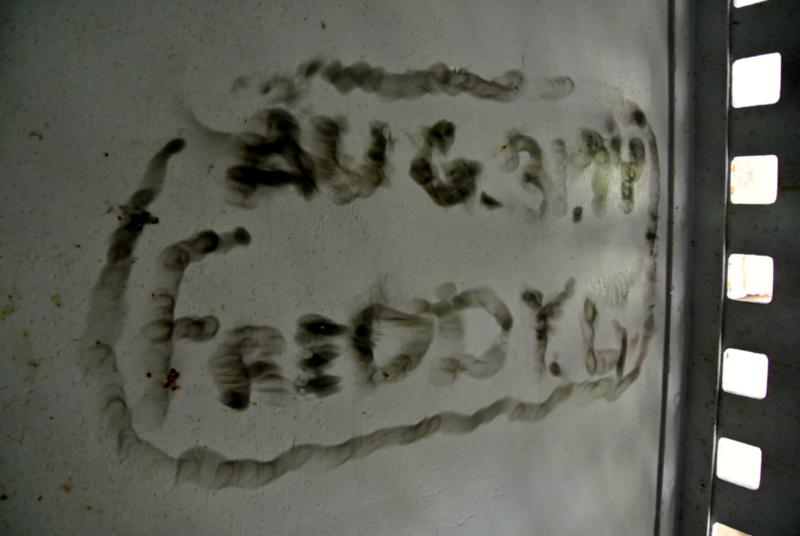 Starting this Friday (I am writing this on Thursday, July 9, 2015…so tomorrow) every county official had to be moved out of the courthouse, as treatment for asbestos was set to begin. 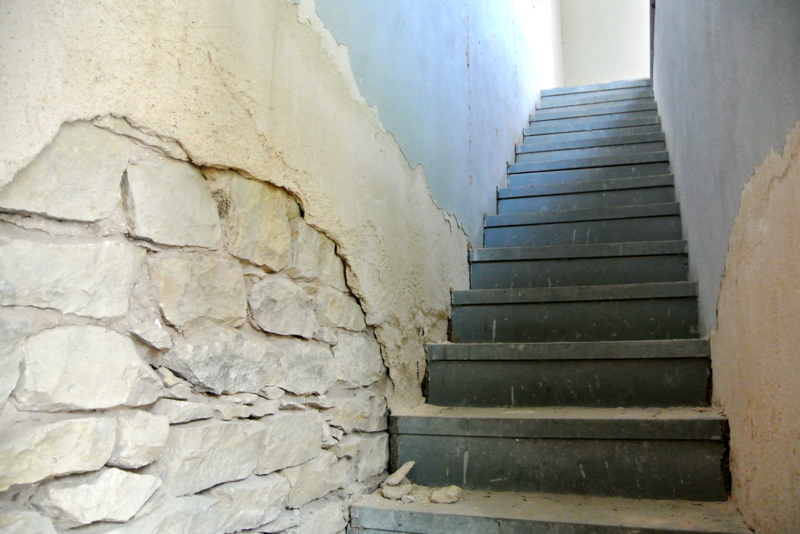 This is the first step in the impending county-funded courthouse restoration. 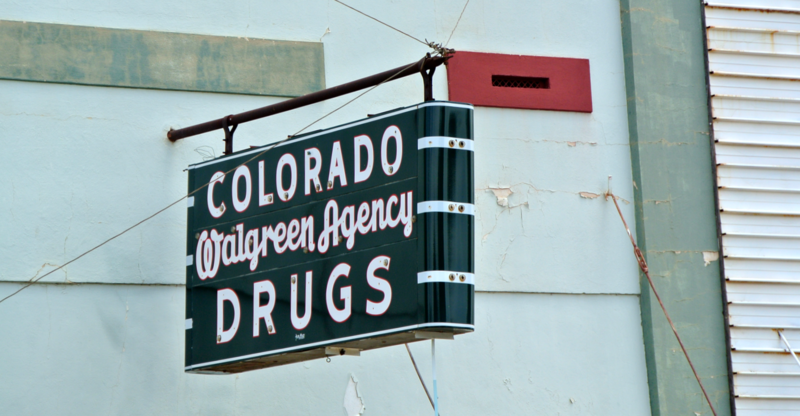 The citizens of Glasscock County are financing it themselves, without state aid from the THC. The THC’s program is a God-send to many Texas counties. I myself have seen the wonders they’ve been able to work. See Wharton County for confirmation of that. However, they like things a certain way. 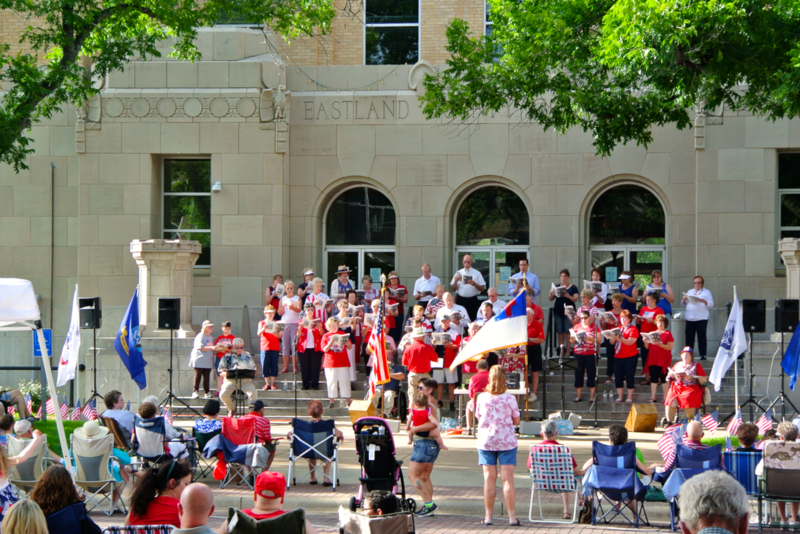 During their restoration of my home courthouse in Hood County, a big debate erupted when they vied to paint our clocktower red (over the grey), or else they’d pull their funding. 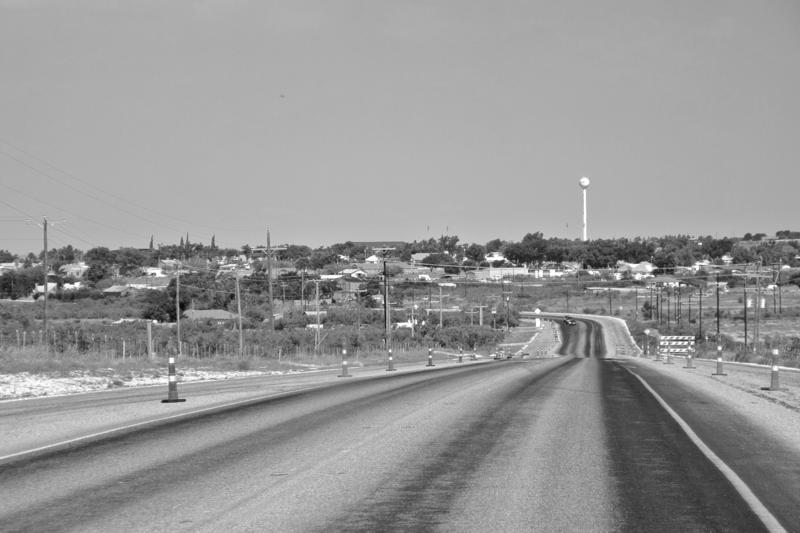 Eventually, tempers subsided, and Hood County got to keep its gray. Thankfully. I just could never have seen it red. 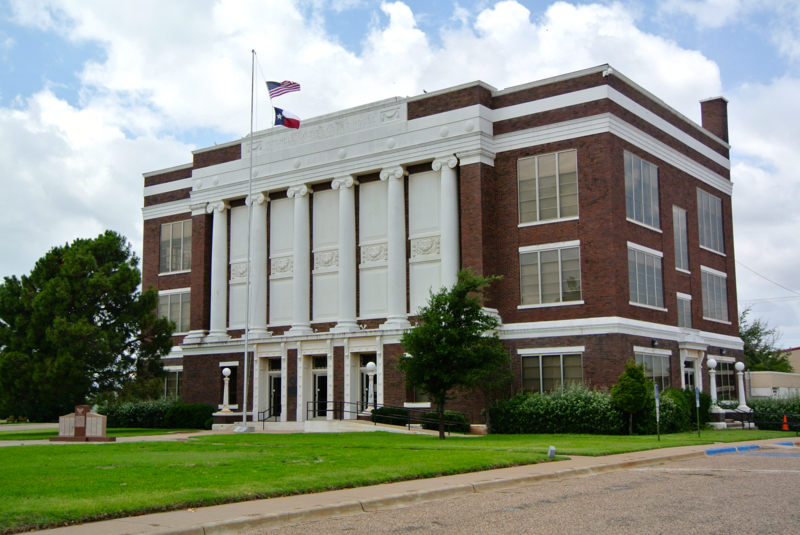 That being said, I understand any wish not to work with the THC, and I have infinite respect and admiration for the people of Garden City and Glasscock County who are willing to pull together and give their courthouse the facelift it deserves. Mr. Dierschke mentioned how they’d pull the wooden paneling away and take up the carpet in the courtroom, restoring a hard wood floor. Other renovations would occur that included (I’m sure) the removal of the modern-looking chairs and the cleanup of the courthouse exterior in places like the pediments. 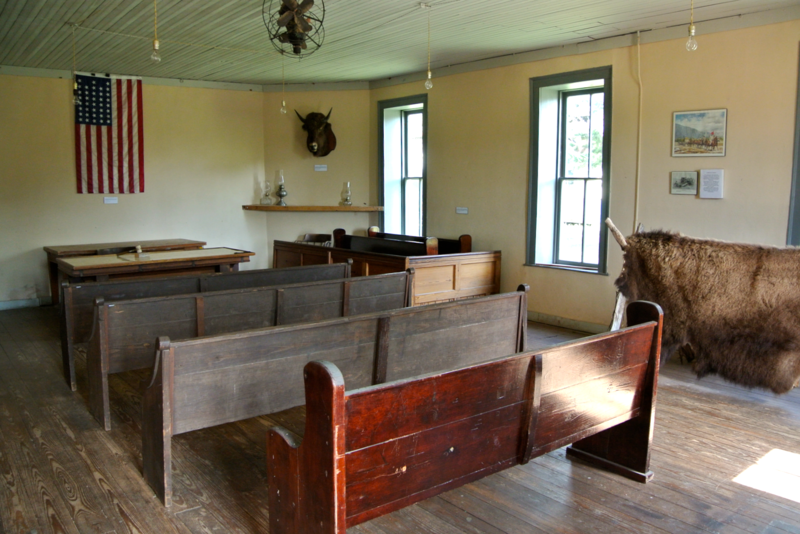 The judge’s bench is the only original feature to this courtroom. He showed us some interesting features within the building as well, such as an original fireplace in one of the offices, and a “get away” staircase behind a door near the judge’s bench. I was reminded of Shelby County at that. When our tour had ended, we thanked him and said our goodbyes. I’m sure he quickly resumed his process of clearing out his office in preparation for the asbestos treatment. Rather than continuing west for Midland, we turned north for Howard County (#224). I was surprised, upon entering the seat Big Spring, just how large the town is. 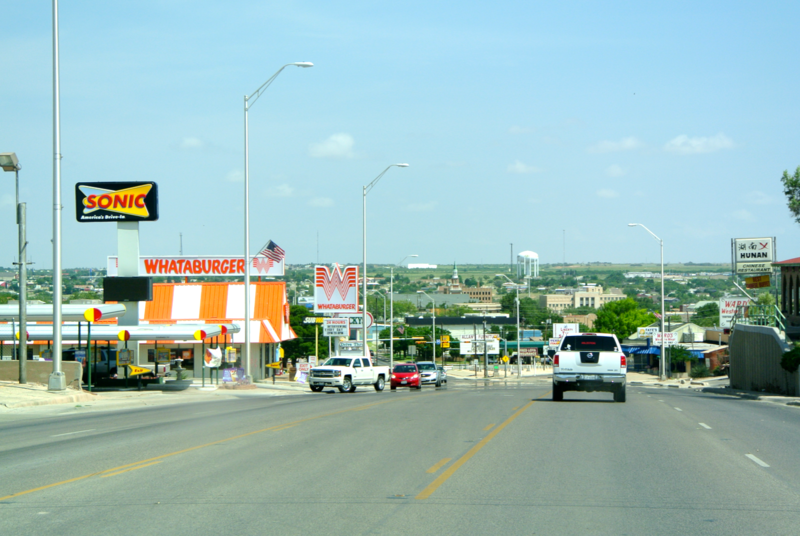 Population-wise, it stands as the ninth-largest city in West Texas behind El Paso, Lubbock, Amarillo, Midland, Abilene, Odessa, San Angelo, and Socorro. Still, for this trip, it was of the largest cities I visited outside any metropolitan area. The largest building to catch my eye, entering from the south, is the large and expansive Veterans’ Hospital of West Texas. 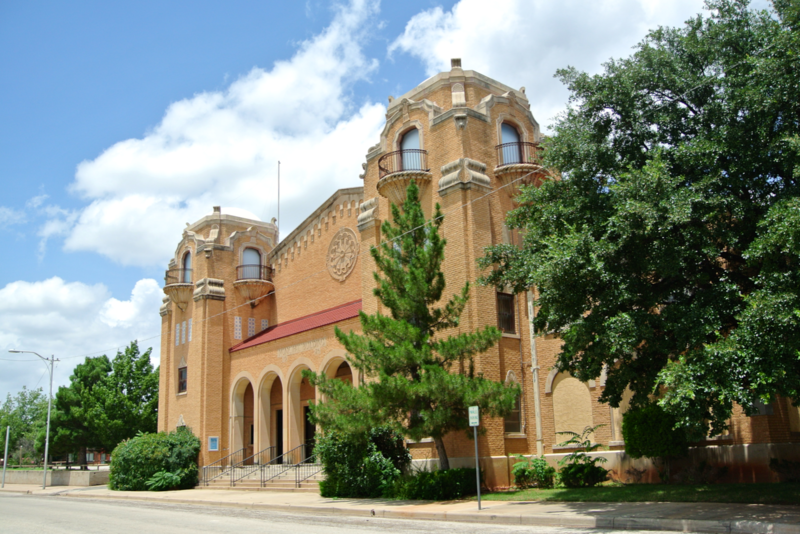 It, along with my next find, are the two most interesting buildings in Big Spring. 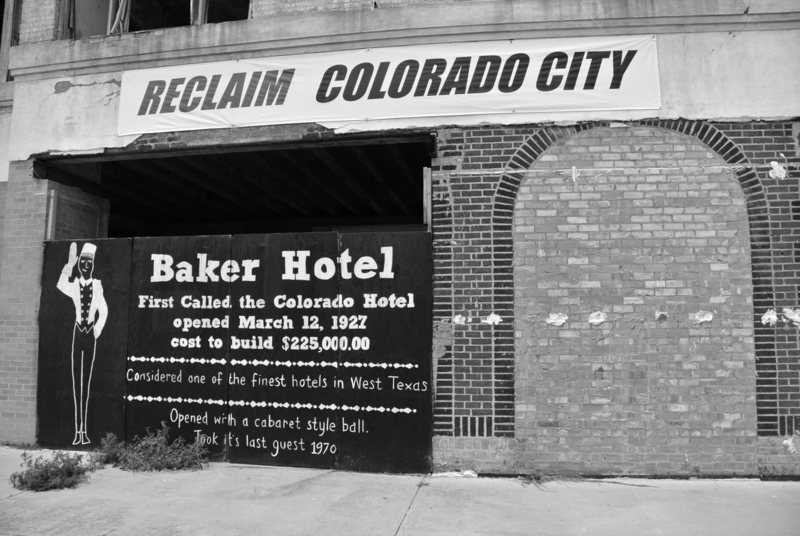 The is the historic, fifteen-story Hotel Settles (which opened in 1930, and was abandoned in the 80s). 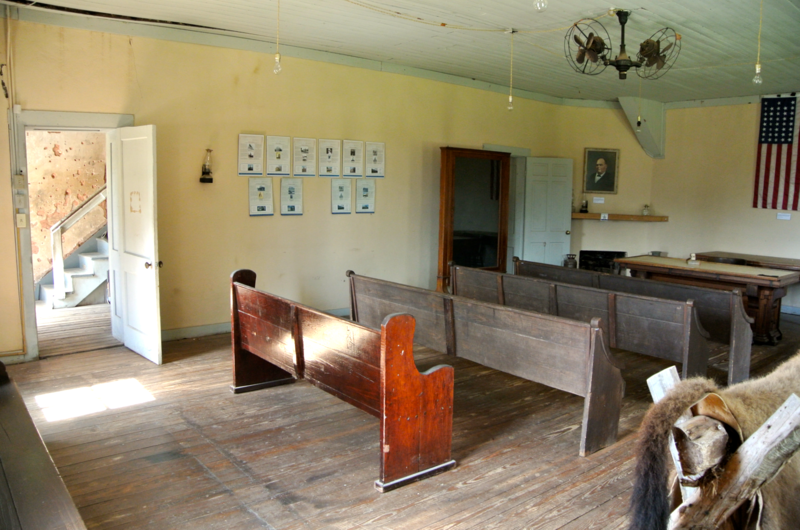 In 2013, the building entered the National Registry of Historic Places after re-opening its doors to the public four months earlier. Today, the bottoms floors are used for retail purposes. 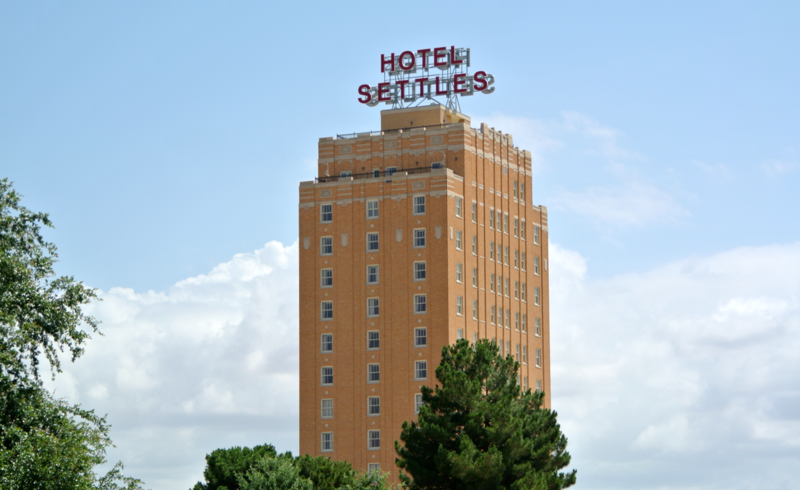 It’s a very pleasant hotel, and is striking to the Big Spring skyline. 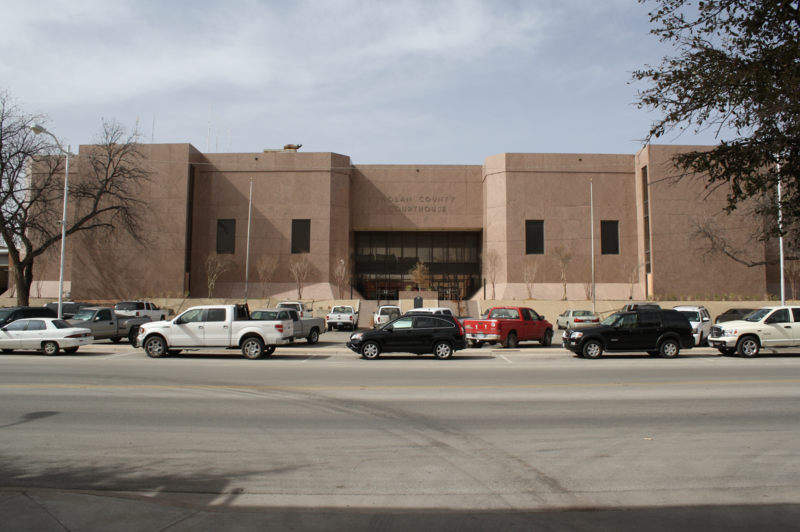 The courthouse, meanwhile, is just “another face in the crowd” of West Texas modern architecture. I have nothing to say about it. It was from Big Spring that we turned east, and began our slow journey home. Joining I-20, our path took us into neighboring Mitchell County. 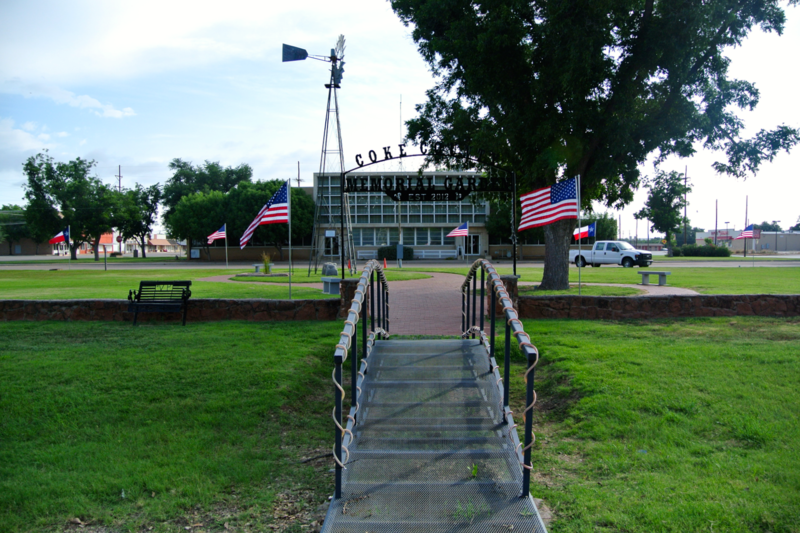 Though the headwaters of Texas’ Colorado River are found southwest of Gail in Borden County, the settlement of Colorado City was named for the river, and is semi-close to them. Taking the business exit from the Interstate, the courthouse and downtown district quickly became visible. 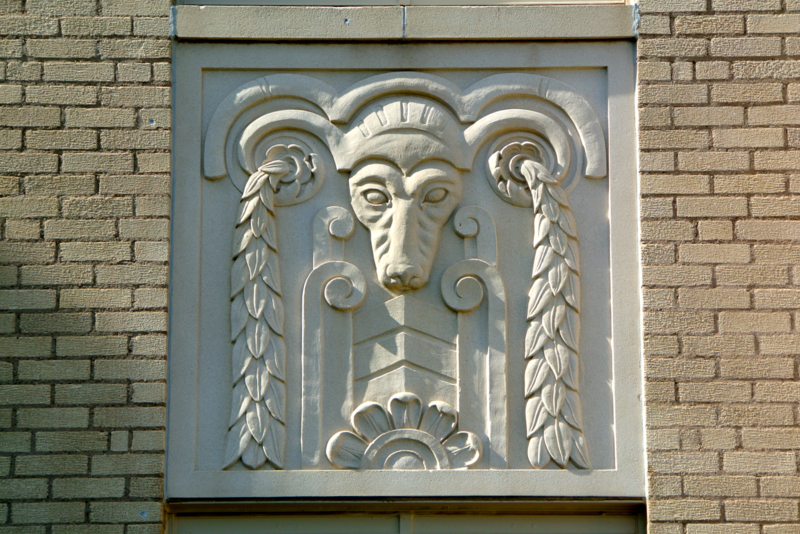 This building comes to us from the year 1924, another work courtesy of David S. Castle. You wouldn’t know that right off the bat, as the courthouse bears some distinct differences from his other works out this way. 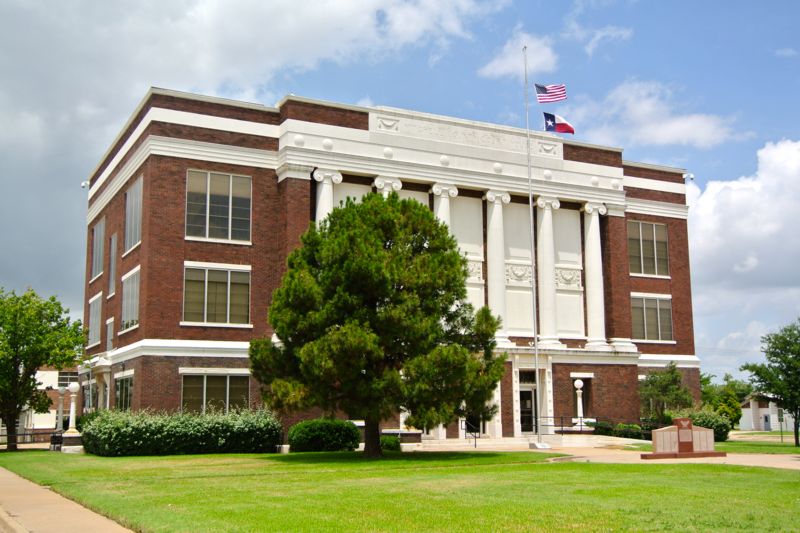 I suspect that’s because it was one of the earlier ones, erected a few years before the Art-Deco and Moderne styles of the Great Depression settled in among Texas architecture. Since its creation, the windows of the main façade were smashed and filled in with concrete. As to why that was done, I’ve got no idea…yet. Seems like a lot more money could have been saved by just investing in blinds, if it was the sun they were worried about. If you’re wondering where Waldo is, I’d check Colorado City. The town’s got a fascinating downtown area that we explored after the courthouse. Like Big Spring, it has a historic hotel too (just not as tall as the Settles), but it’s not been opened back to the public. 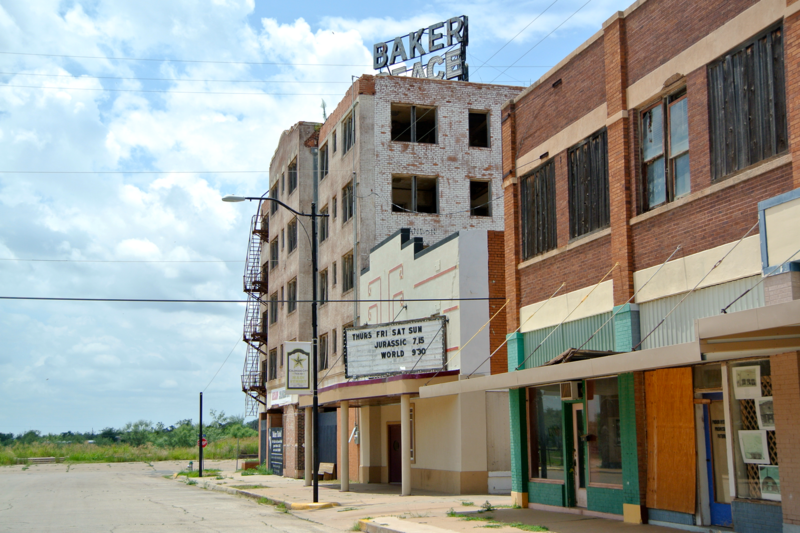 Just like the hotel in Mineral Wells (of the same name), this Baker Hotel has been abandoned for some time. 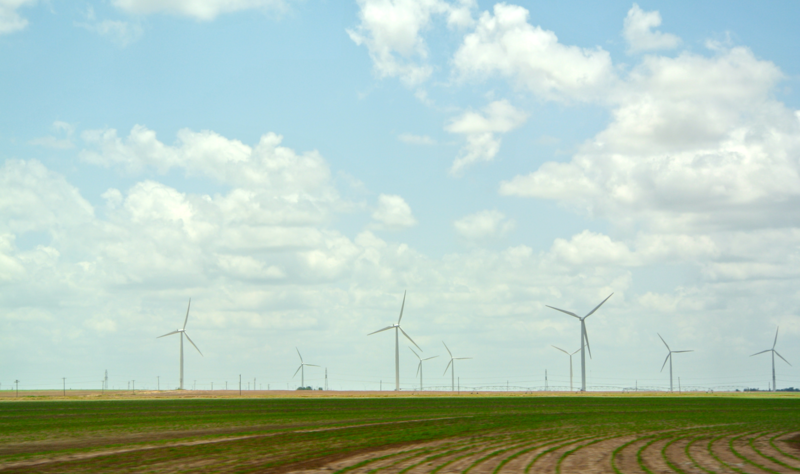 More wind turbines appeared out our window as we chugged down I-20 over farmland between Mitchell and Nolan Counties. 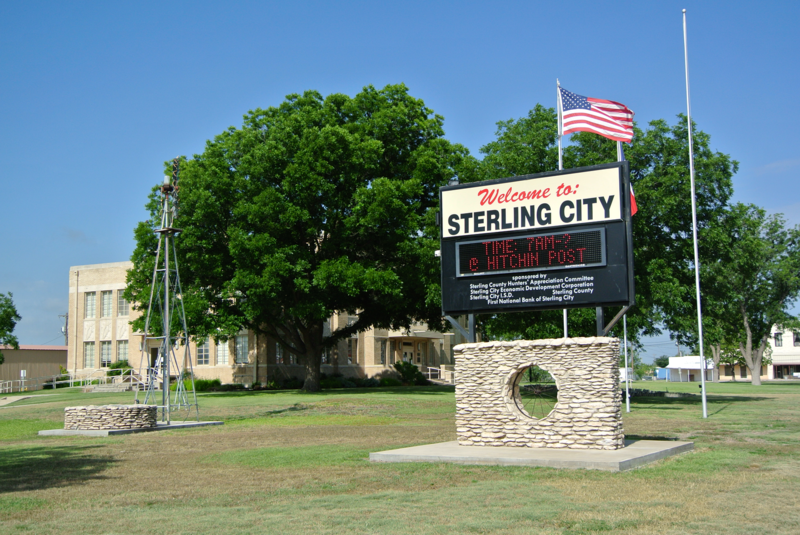 We figured there was a possibility that those that we saw far in the distance to the south, could have been those that we’d seen far in the distance to the north earlier (while crossing from Robert Lee to Sterling City). 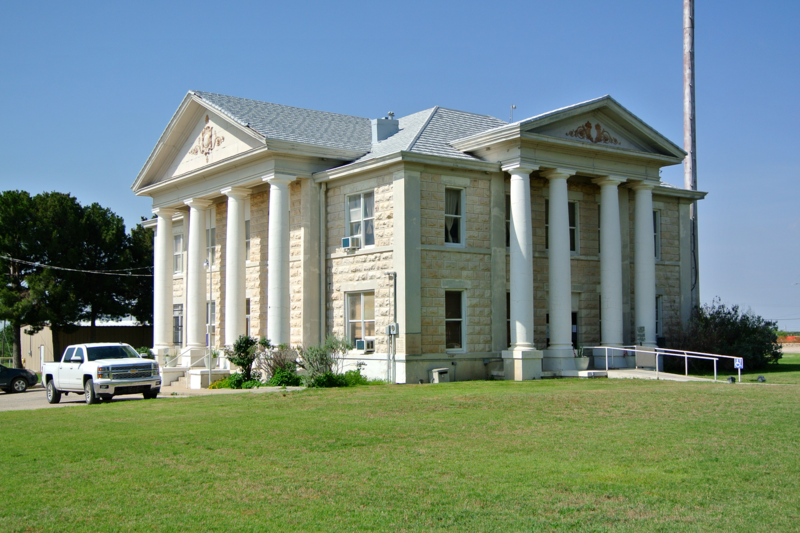 The next courthouse stop was in Sweetwater. 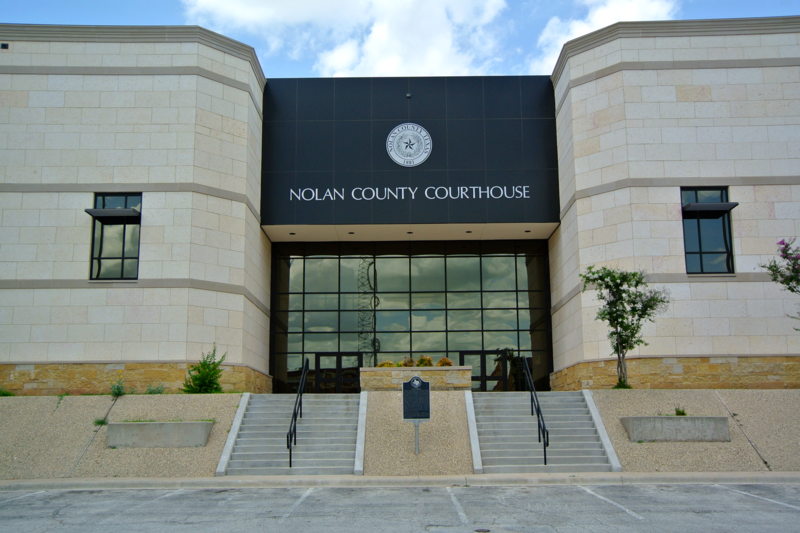 Nolan County’s courthouse would make #226, the final new one for this trip. 28 to go! It was less a month ago when that number was 54. This project was completing itself before my very eyes. Now, we have yet another building that’s taking part in the new architectural trend of paying homage to the classic courthouse style. 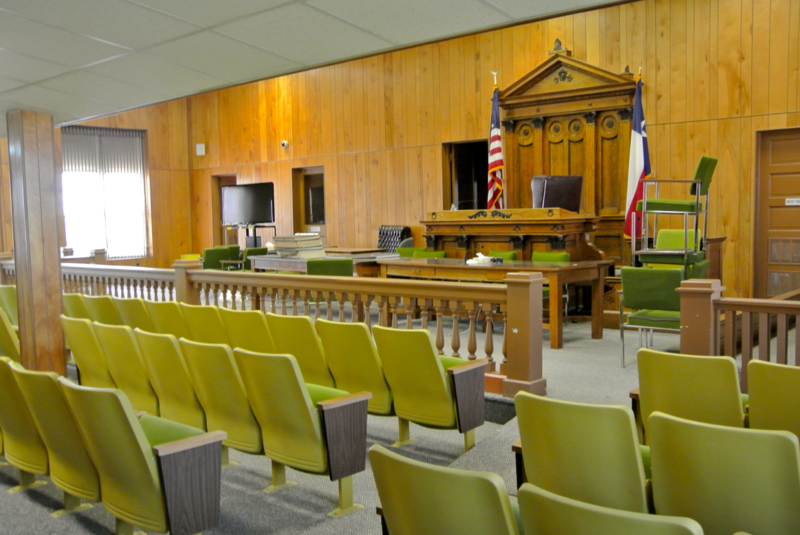 A new era of courthouse construction and design has begun, and thankfully, some counties are choosing to take pride in their court buildings, and transcend the modern values of the 50s-80s. I love seeing this. 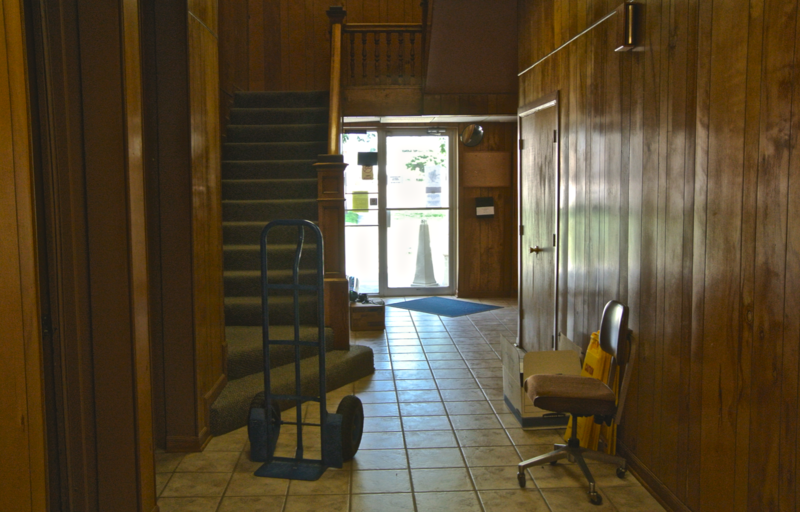 I peeked through several doors (locked, as it was Sunday) while walking around the courthouse. The lights were turned off and it looked pretty empty inside, so imagine my surprise when peeking through the western door I saw a lady staring back at me. She opened the door and asked if I needed inside, and I told her no. I was curious, though, why she’d be there on a Sunday. I’m not sure whether or not she was a patron or a county employee, but she told me that she was there because it was inmate visitation day. Hmmm. Good thing I didn’t go inside. Thanking her, I moved on. So that was that. 226 courthouses down! 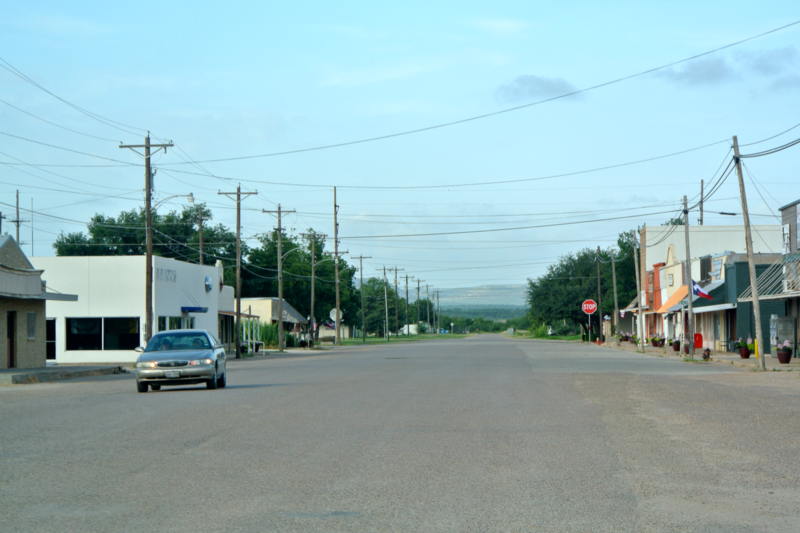 Before leaving Sweetwater, we took a minute or two to drive through the downtown area. The Municipal Building (ca. 1926) was the coolest find, in my opinion. 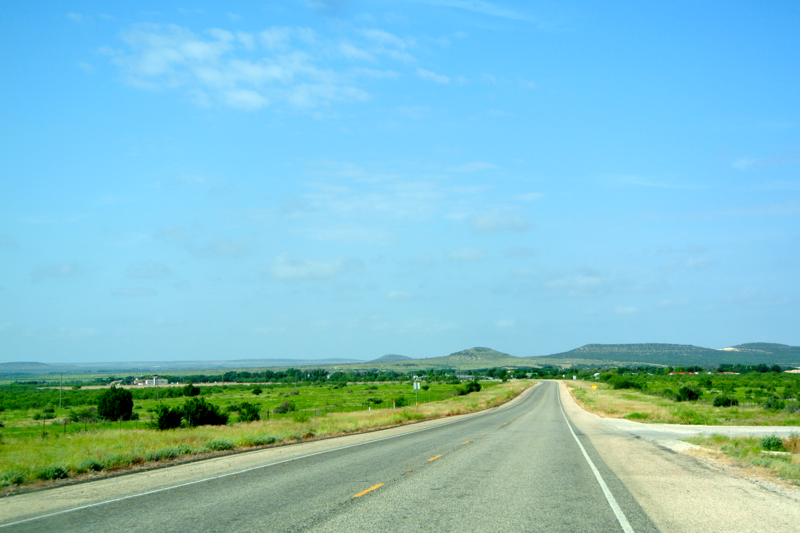 Next, we found our way back to the Interstate and left Nolan County behind, headed for familiar territory. The next county to the east is Taylor (#140). 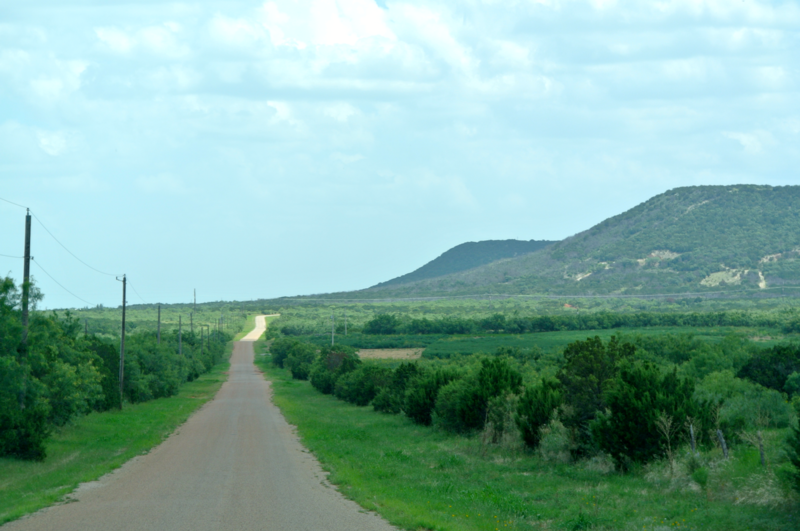 You may’ve heard of the country seat: Abilene. I snagged that courthouse on Thanksgiving Day 2013, when visiting some friends out this way. On the Taylor County page I made a claim that I had no intention of every returning to revisit the courthouse there (given that I took the pictures with the iPhone). It’s understandable why I wouldn’t want to. As it was completed in 1972, it doesn’t take much to realize this one’s not a looker. 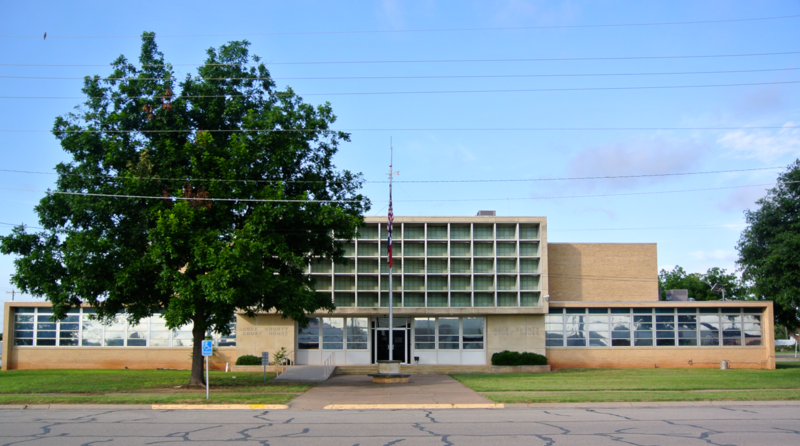 No, I probably won’t ever come back to the ’72 model, but that’s not the only courthouse in Taylor County. 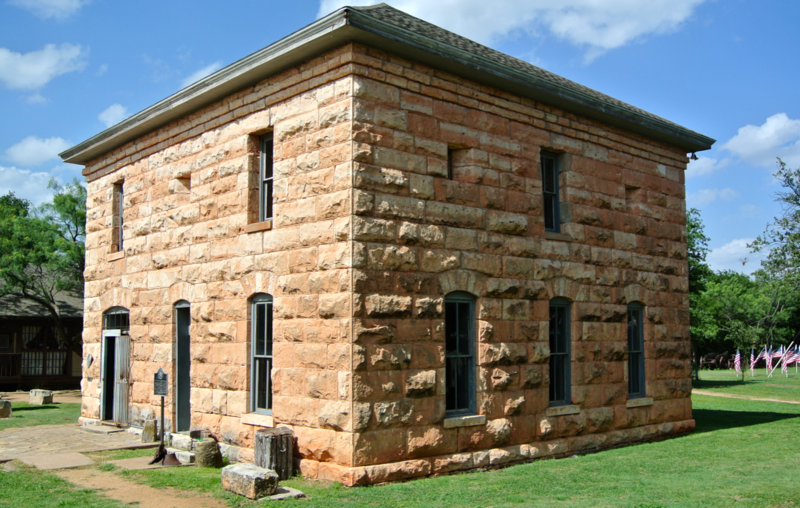 The very first one, constructed nearly one hundred years earlier in 1879, is still standing in Buffalo Gap. It’s a small town in the center of the county between some large, rolling, beautiful hills. It’s in this region that said hills begin steadily getting larger and larger, eventually finding their way to Upton County. North of here the landscape is pretty flat, and stays that way until the Canadian River watershed zones, Palo Duro Canyon, and the Caprock Escarpment. 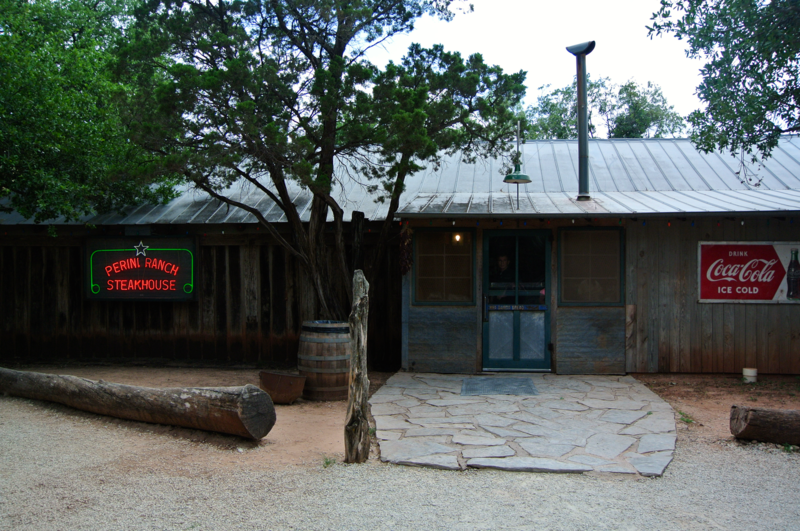 Buffalo Gap boasts a destination restaurant that brings out-of-towners to the tiny community. It’s called Perini Ranch. At my grandparents’ insisting (who’d been there many times before), we stopped and had a late lunch there. 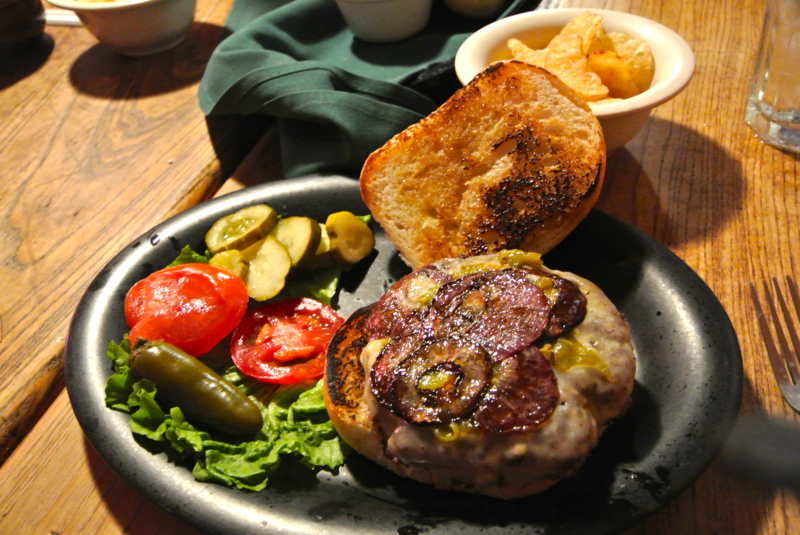 The burger I had was billed as “Today Show Award Winning” and I could see why! Lunch was delicious. 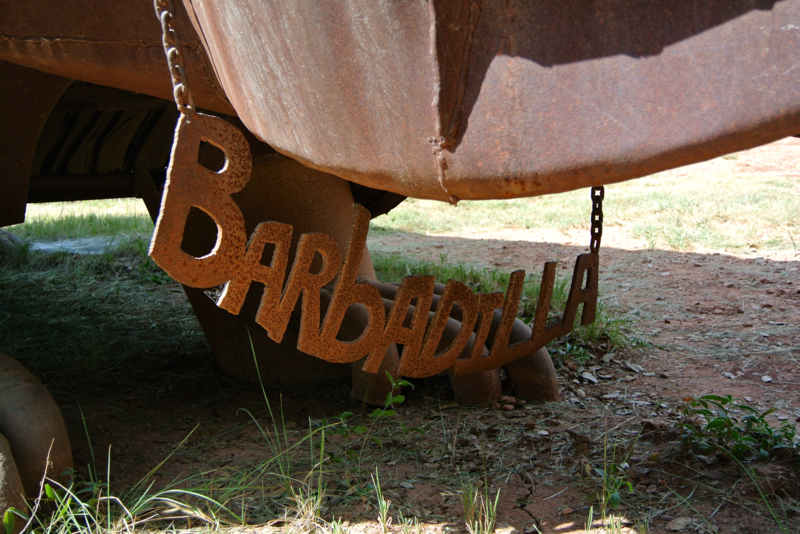 “Barbadilla” greats visitors as they drive in. 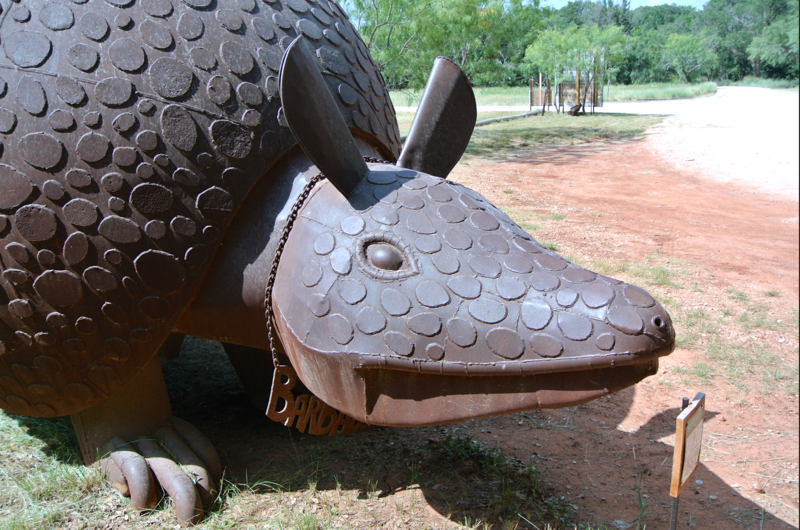 He’s certainly one of the largest metal armadillos I’ve seen, but he doesn’t have the world record. That title belongs to “Killer” in my home town, Acton. I ought to know. My family owns him. We arrived at the 1879 courthouse only to find it behind a fence. Turns out it’s not accessible to the public for free, but rather for $4.00. 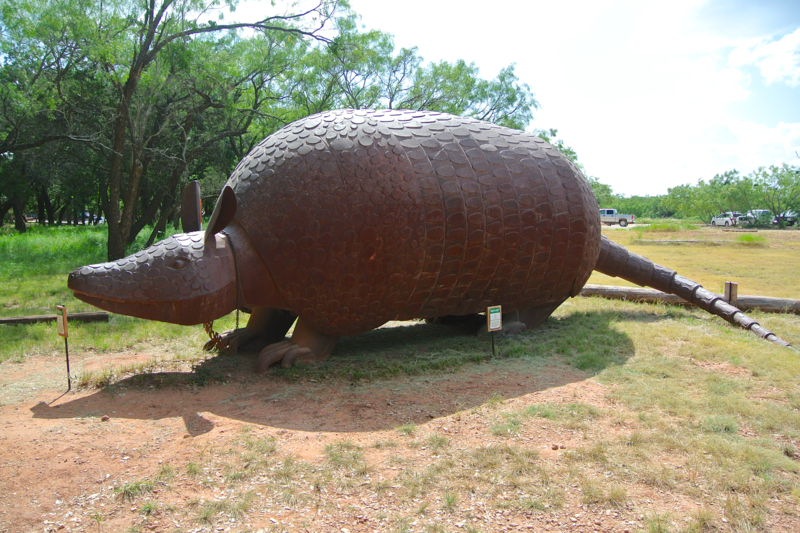 These days, it’s been turned into an attraction at the “Buffalo Gap Historical Village” and serves as a museum on early Taylor County. When we pulled up, they were closing for the day. Thanks to a very nice museum worker (whose name I didn’t catch), he let us “sneak in” past 5:00 and catch a few pictures of the courthouse…and he didn’t charge! I’m very thankful. There’s some other neat displays scattered around this “historical village”, but we didn’t have the time to stay and investigate them. We didn’t want to push our luck. 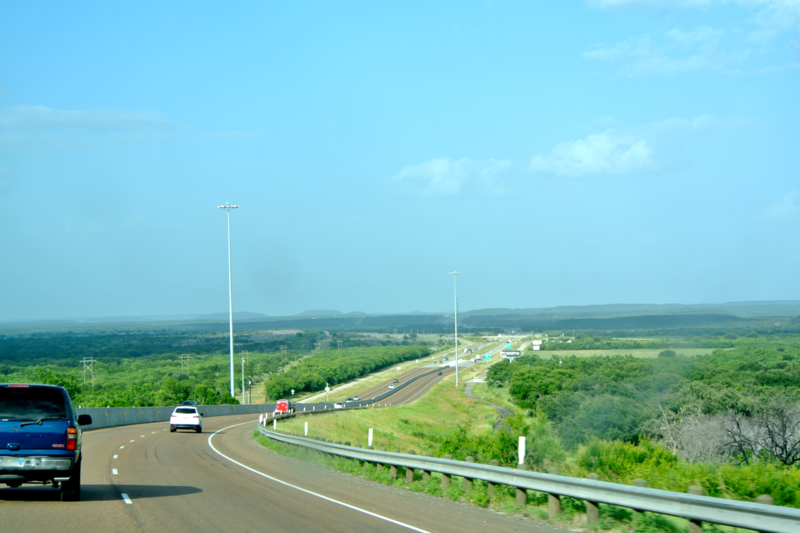 So we said farewell to Buffalo Gap, and headed northeast to Abilene, to rejoin the Interstate once more. At that point, I put up my camera once and for all, as the trip had drawn to a close. 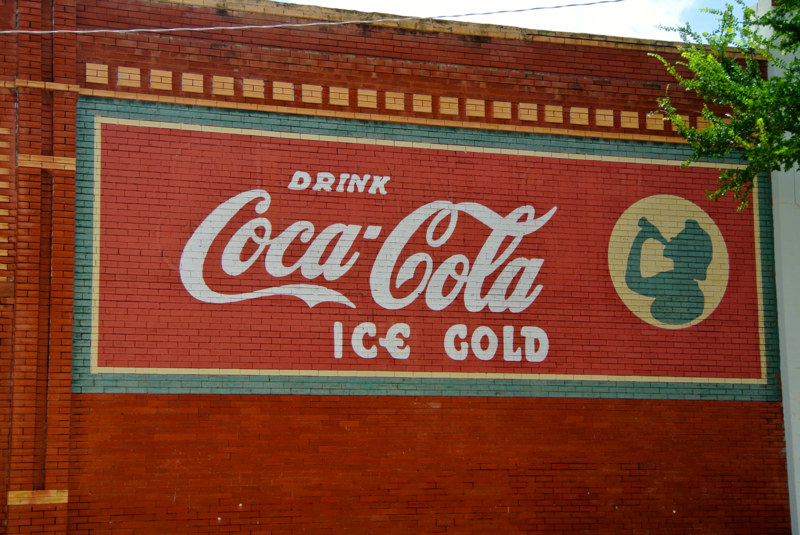 About forty minutes later, when we were passing through the city of Cisco, I realized that I could make one more stop. 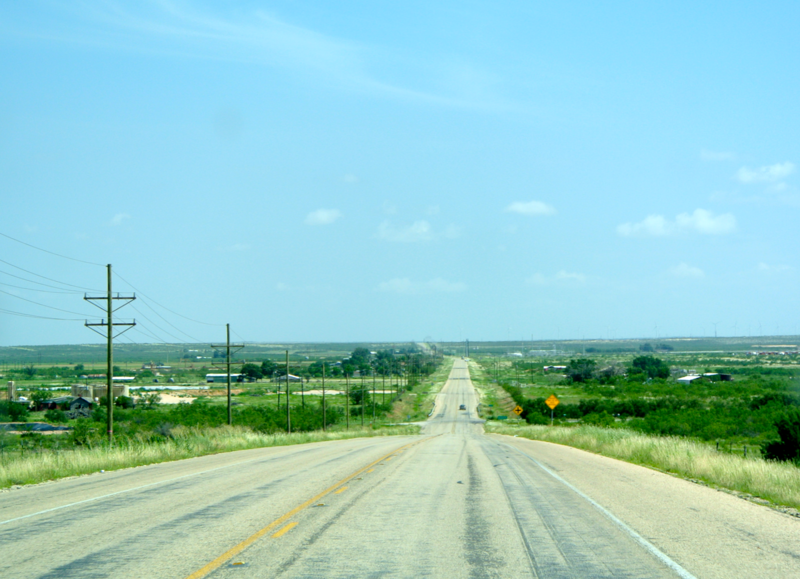 We were now in Eastland County, which has been on my redo list for some time. I thought…why not knock it out? That’s what we did. 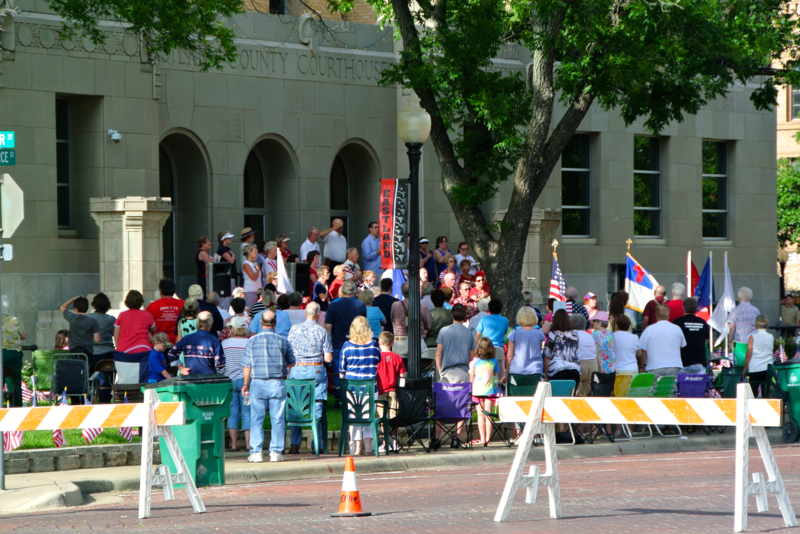 Unfortunately, I discovered when we entered the square, that a Fourth of July celebration stood in my way. Keep in mind, this was on July 5. A day after Independence Day. What?! I had to work with it, though I was a little bitter. To make matter worse, my camera battery died when I was halfway across the square from the car, and had to march back and change it. Fortunately, I was kept in a good enough mood because the courthouse here is truly striking. Combining both Art-Deco and Moderne design, this 1928 building was one of the first to appear in the twentieth century that followed this style. 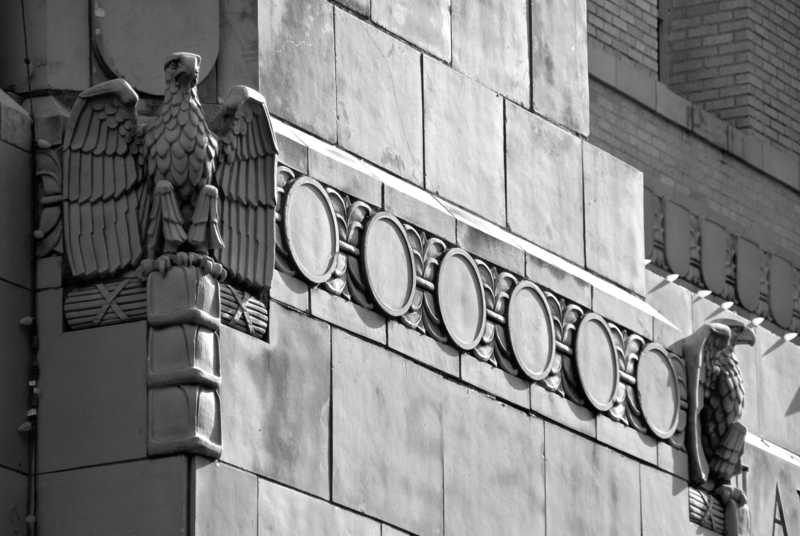 It’s a nice courthouse; the large, ornamental eagles on the top corners are handsome features. The most curious thing here, hands down, is Old Rip. 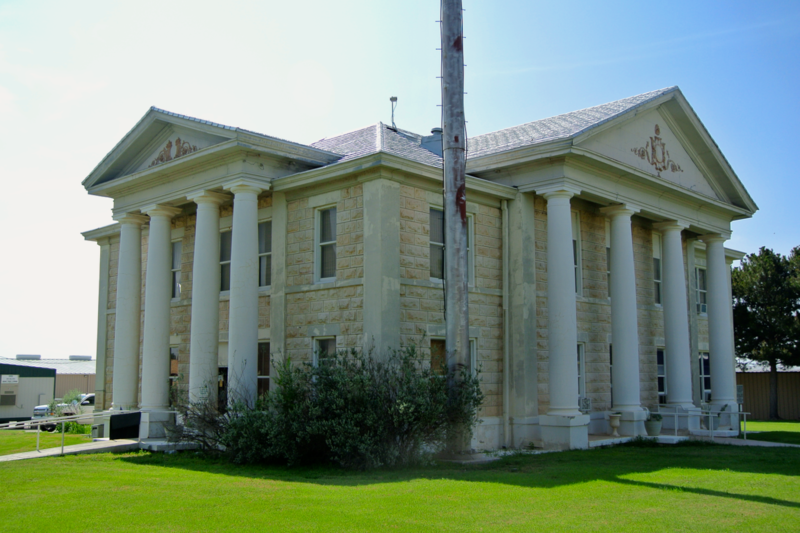 In 1897, Eastland County constructed their third courthouse. To commemorate the opening of the new building, a celebration was held on the city square that included the laying of the cornerstone. The mayor and other town fathers filled this with everyday items from the period, as part of a time capsule to be opened sometime in the 1900s. When the question was posed to the crowd if they had anything to add, one “smart” guy decided to place in a horned toad…live. I’m not sure what he was hoping to achieve. 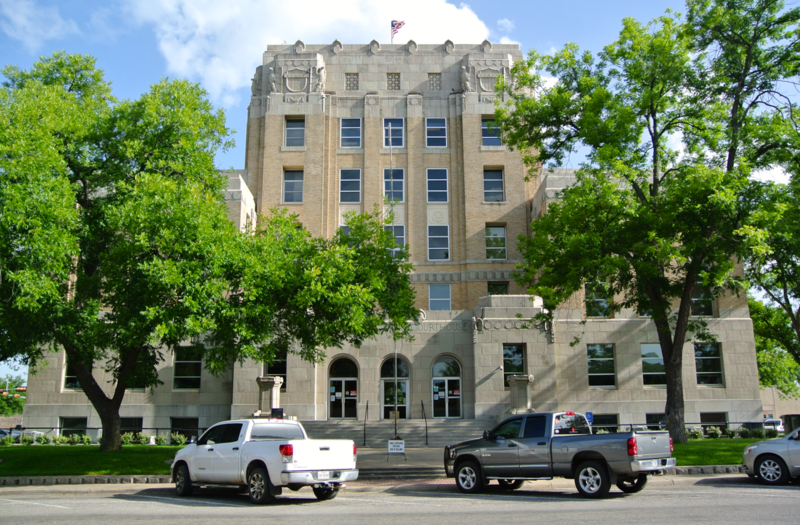 By 1928, the county had outgrown the previous courthouse and down it went. In a similar celebration to commemorate the demolition, the time capsule was opened and the items procured. The legend goes that when the horned toad was removed, it twitched to life. Over night, Eastland gained national fame for being the home of “Old Rip”, the horned toad that survived 31 years without food or water in a stone box. They took the thing on a country-wide tour that even included a meeting with President Calvin Coolidge in Washington D.C. Can you imagine? Whether or not you believe he survived all those years inside the cornerstone, it’s fact that pneumonia brought the little critter down in January 1929. In mourning, Eastland County had the toad stuffed by a taxidermist (who supposedly did the work for free) and put him on display in the window of the courthouse. I’ve put a picture of him here, so if that sort of thing makes you squeamish…don’t click. Just like Old Rip’s did in ’29, our story had drawn to a close. 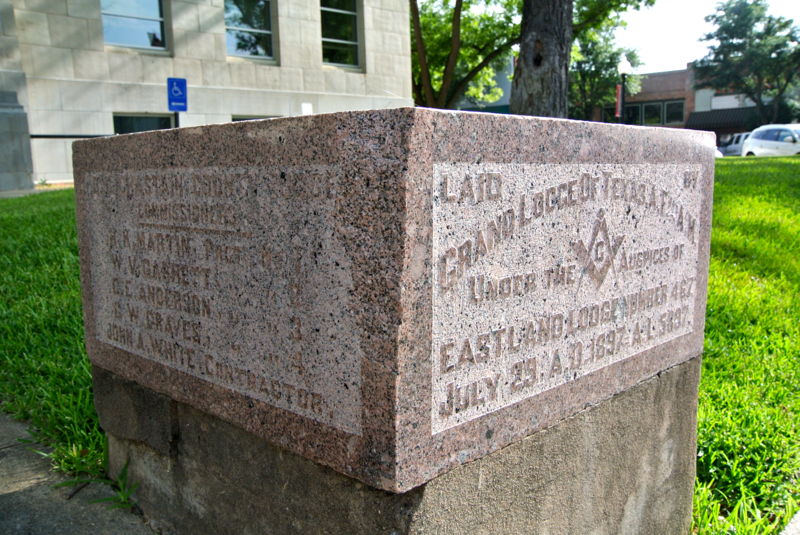 We departed Eastland on I-20, and found our way back home to Granbury in another hour or so. 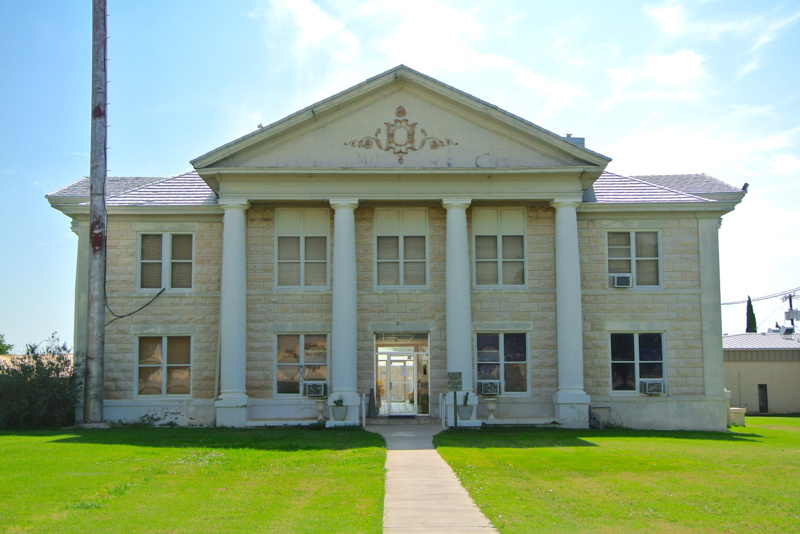 The beautiful Hood County courthouse greeted us upon our return. It won’t be long before I’m finishing this ride at its steps. Stick around.